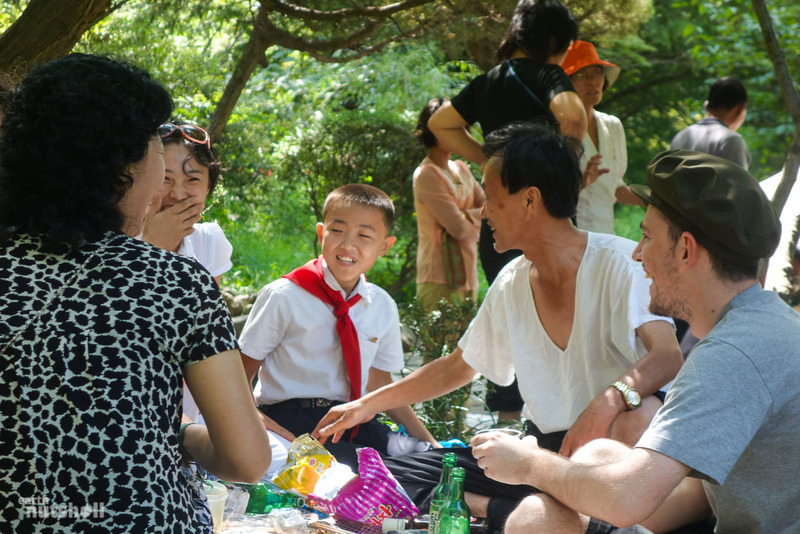 In a Nutshell: I visited North Korea in late 2014 and over 16 days ventured to all corners of this mysterious nation on one of the longest itineraries ever executed for foreigners. 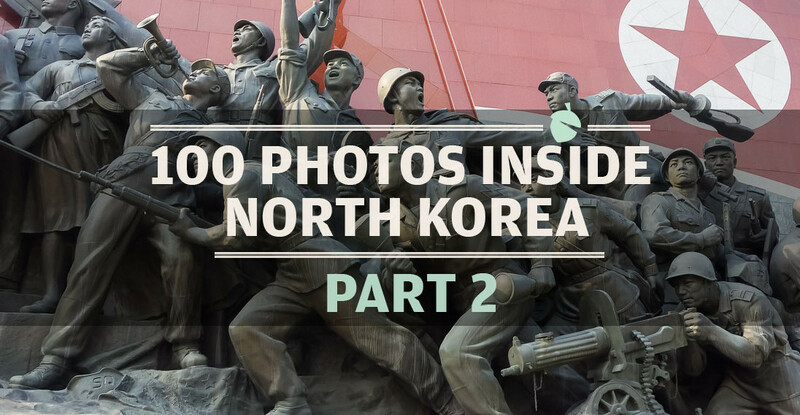 Here are 100 photos (part 1) taken during this visit to North Korea. 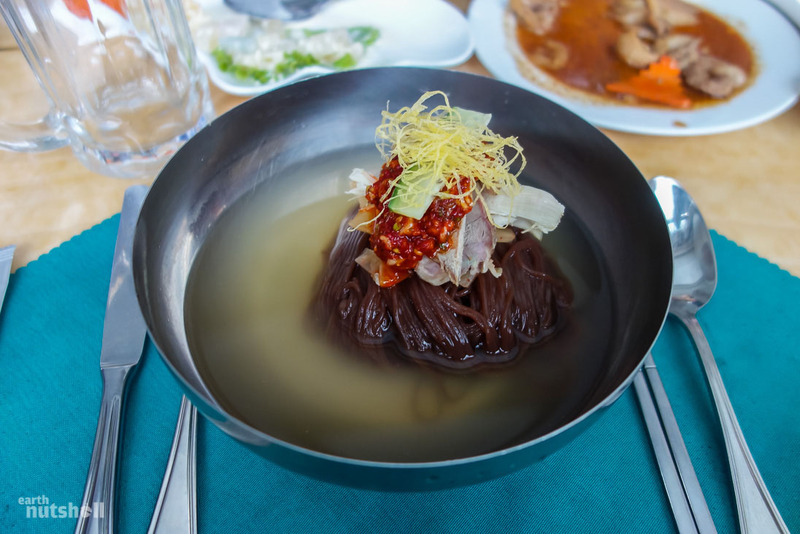 Naengmyeon noodles, a delicacy originating in Pyongyang. It’s a dish served cold with dressing and red chilli paste. It’s quite tasty but difficult to eat with chopsticks. This makes me nervous. 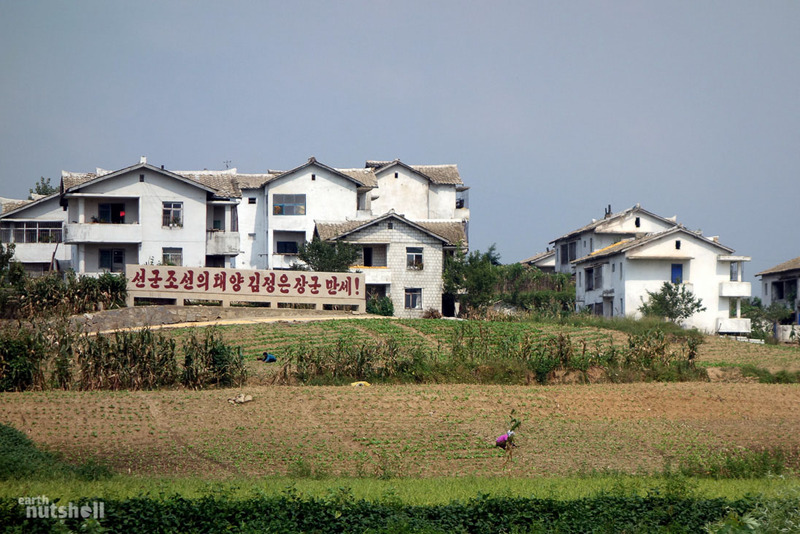 This photo was taken in the mountainous countryside of North Korea’s second largest city, Hamhung. 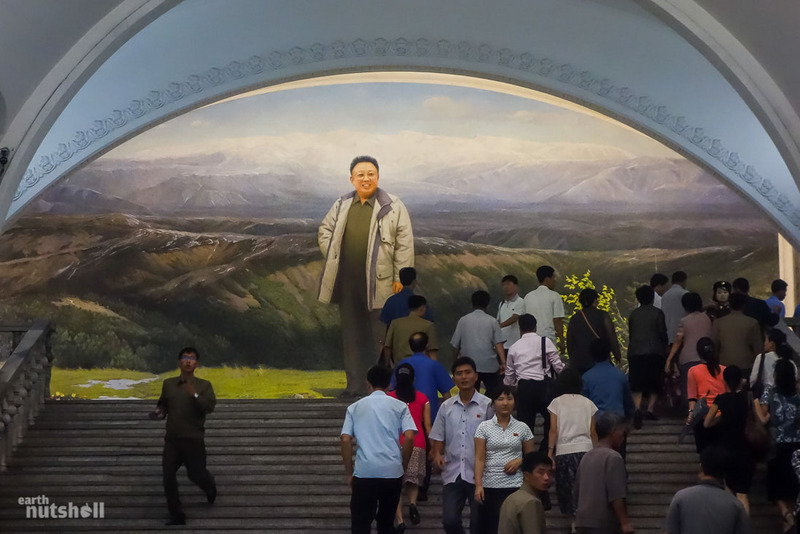 General Kim Jong-Il is never far away. 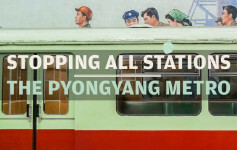 Departing the Pyongyang Metro. 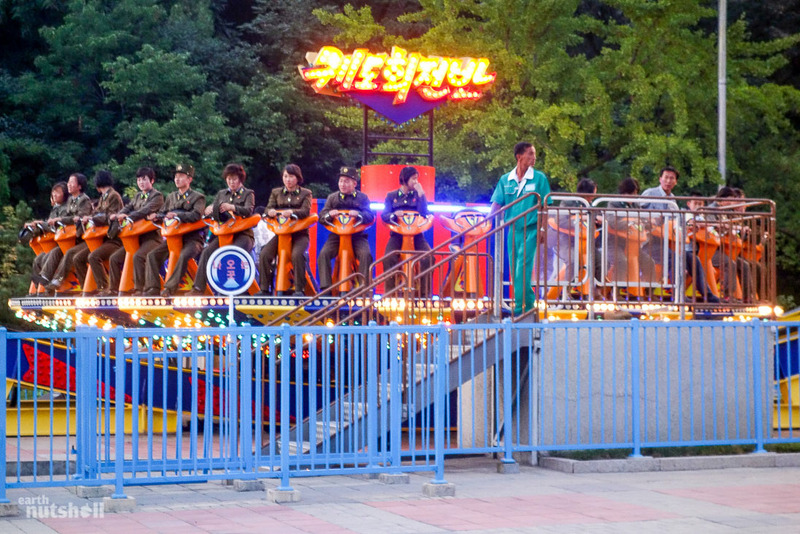 Korean Peoples Army soldiers in uniform enjoying some downtime on rides at the Kaeson Youth Amusement Park, Pyongyang. 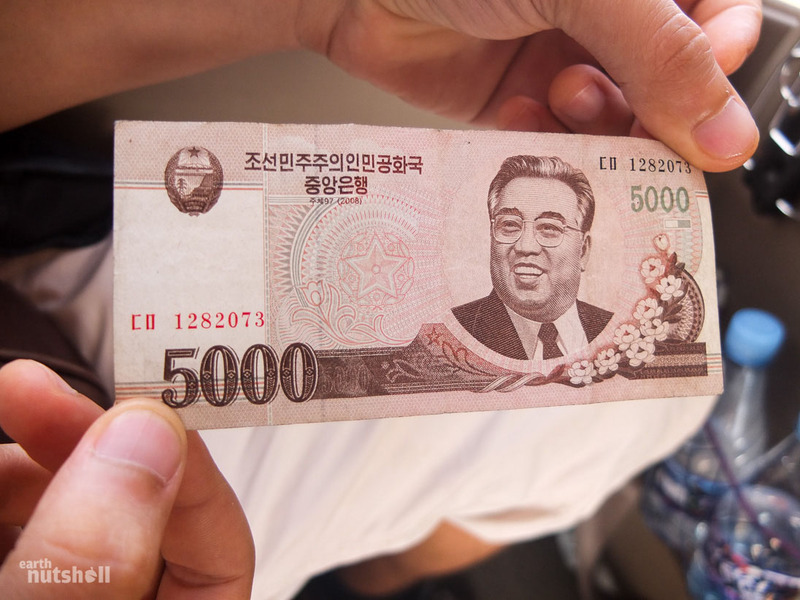 It’s illegal for tourists to handle or obtain local North Korean Won. To pay, you must use either USD, Euro or Chinese RMB. Lower denominations are highly recommended, as correct change is rarely given. I received a Sprite, chewing gum and a North Korean flag postage stamp as change during this visit and sometimes got no change at all. 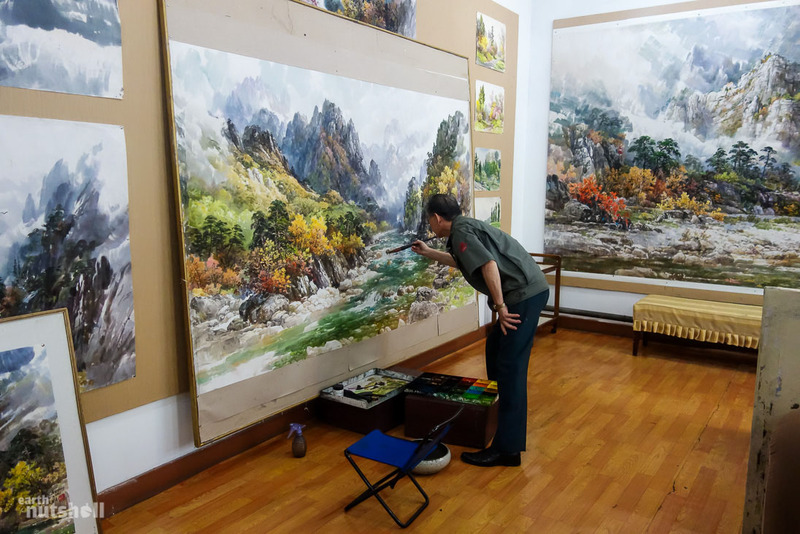 Mansudae Art Studio, Pyongyang. 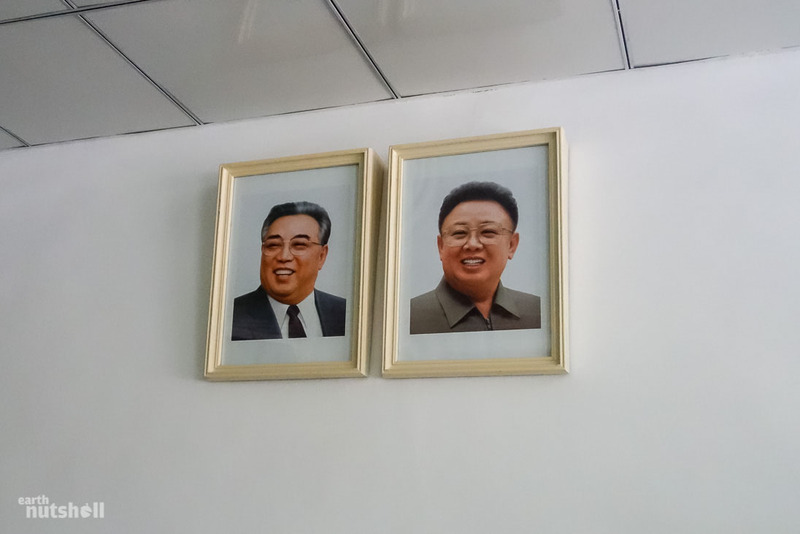 Pictured is a famous North Korean artist responsible for beautiful landscape works adorning buildings in Pyongyang. Yes, he was actually painting. “Let’s protect the great comrades politically and ideologically with our lives!” You can make out small solar panels sitting on apartment balconies here. Solar panels are becoming commonplace all over North Korea as people demand alternative power sources. 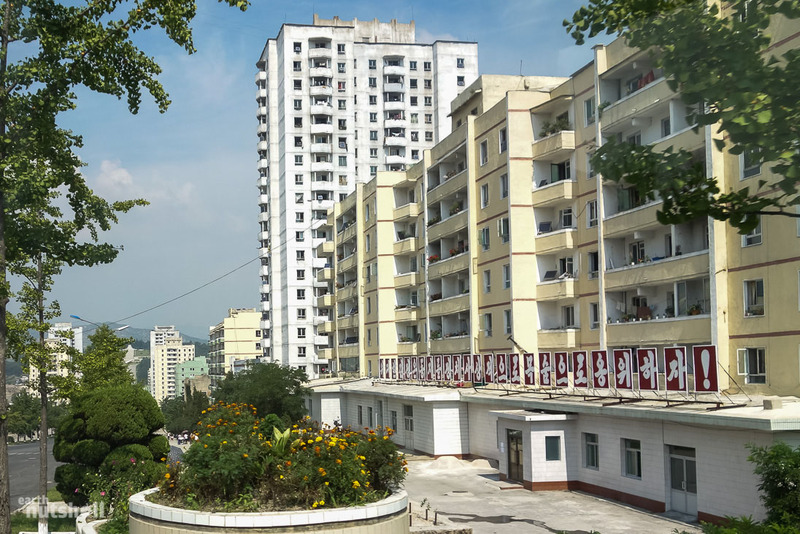 Electricity remains a luxury and even Pyongyang experiences regular, intermittent power cut-outs. 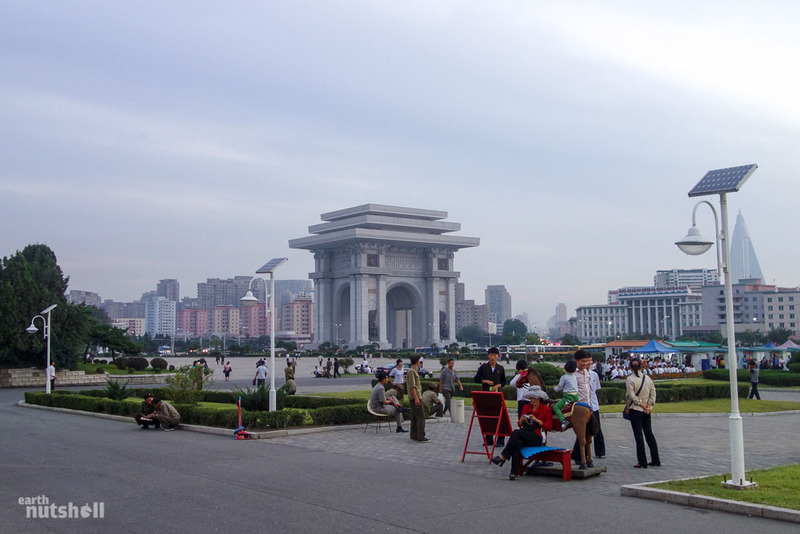 The southern gateway to Pyongyang denoted by the Arch of Reunification. Behind me is a controlled access six-lane highway that heads south to the Demilitarized Zone. 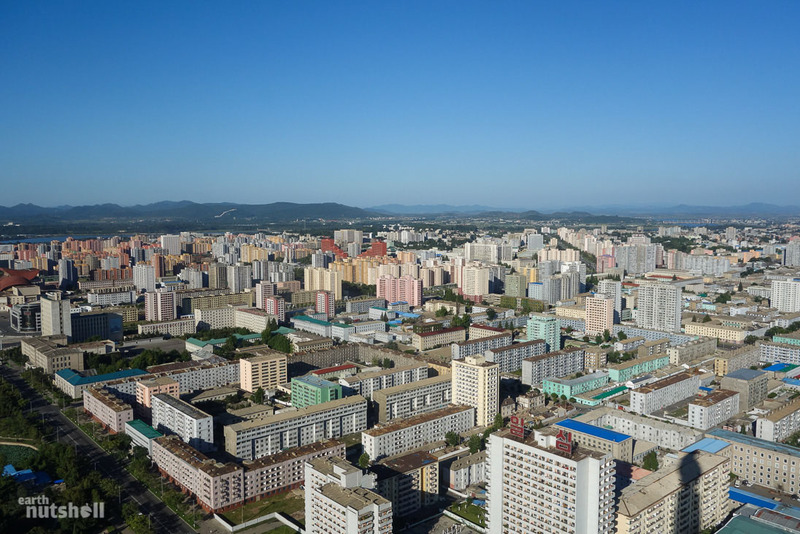 Citizens require special permission to live, work or even enter Pyongyang. 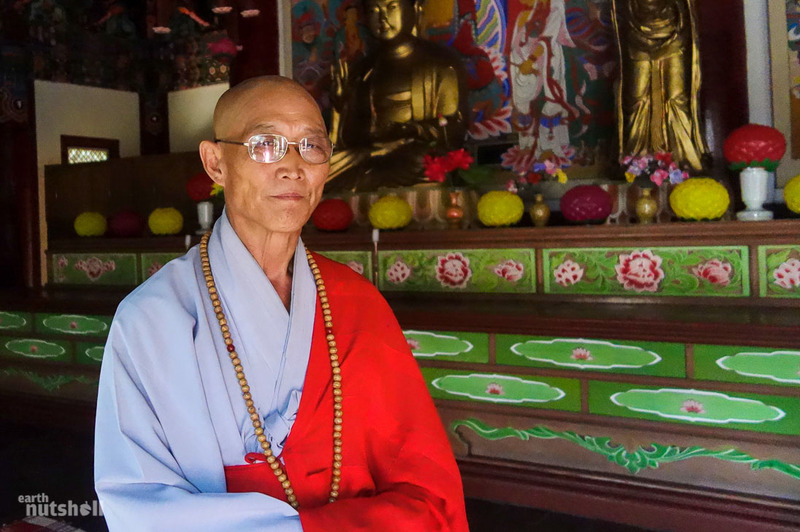 A North Korean monk at the Pohyon Buddhist Temple at Mt. Myohyang. 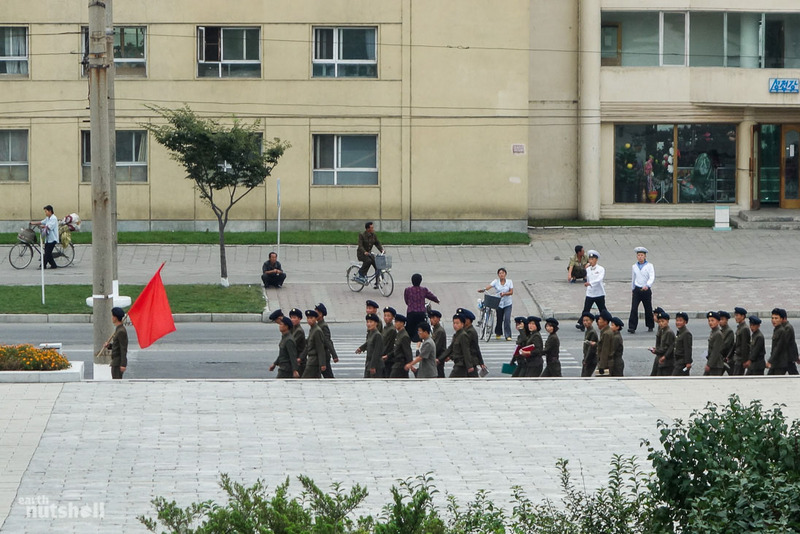 Minority religion took me off guard in North Korea, an otherwise atheist nation with a mandatory belief system of the Juche ideology, the brainchild of President Kim Il-Sung himself. 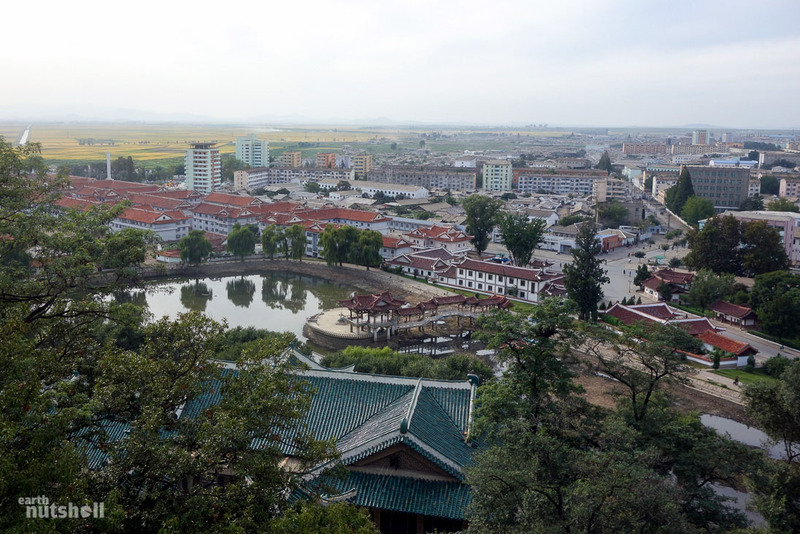 Buddhist temples in North Korea are cultural relics of the past and those who worship have approval. There was even a Russian Orthodox Church in Pyongyang and there’s a mosque in the diplomatic compound. 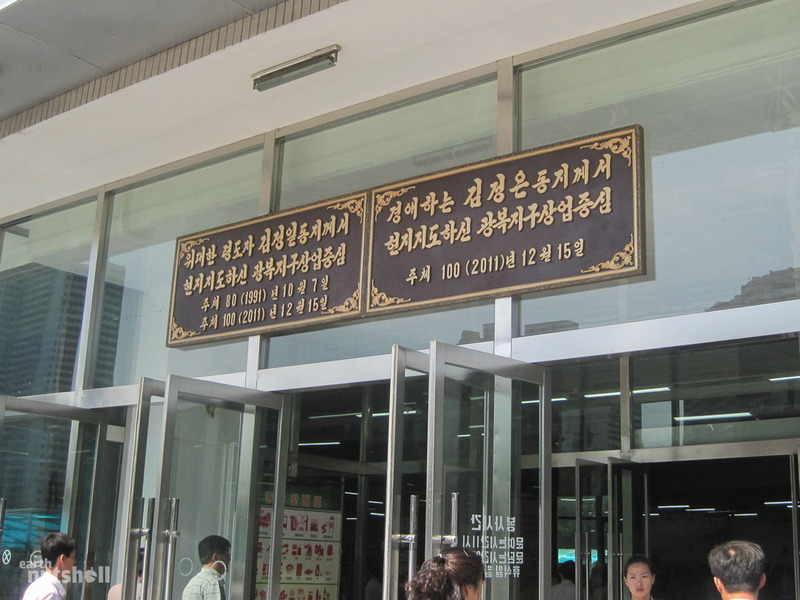 Unauthorised religious activity, especially proselytising in North Korea carries harsh punishment and has been the catalyst behind most foreigner detainments. 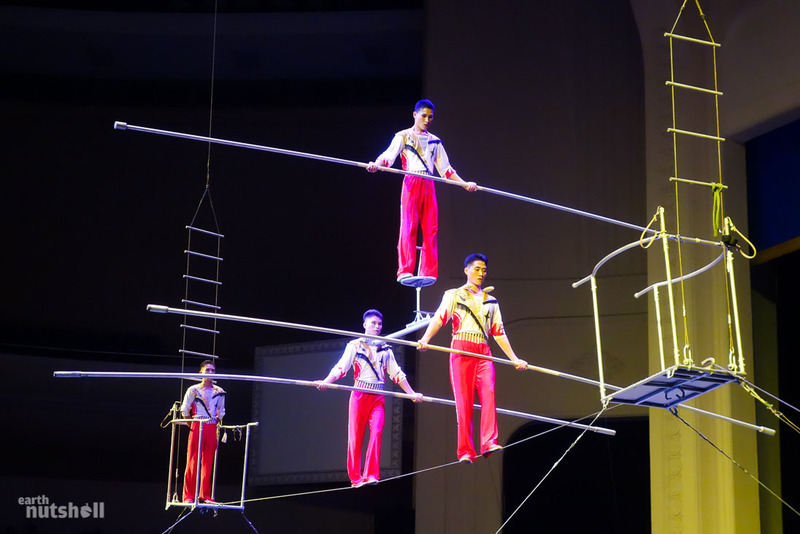 The Pyongyang Military Circus was a surprise in a great way. The performance was flawless and all involved were incredibly talented. No animals were involved in performances either — I was expecting the worst. Animals are still used in the Pyongyang State Circus. 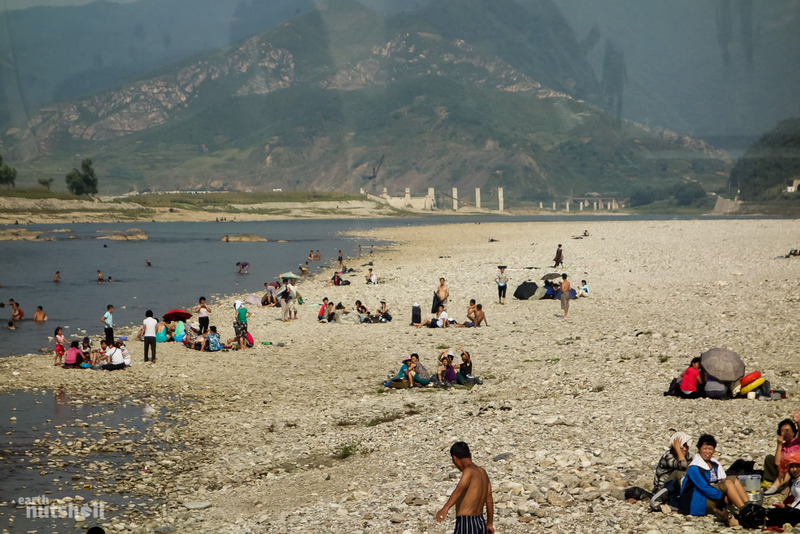 A day at the beach for North Koreans. You are looking across into South Korea. This open space is the Joint Security Area which straddles the political border within the Demilitarized Zone. The physical border is where the light gravel turns dark denoted by the raised concrete line. Cross that line and you’ll be shot. 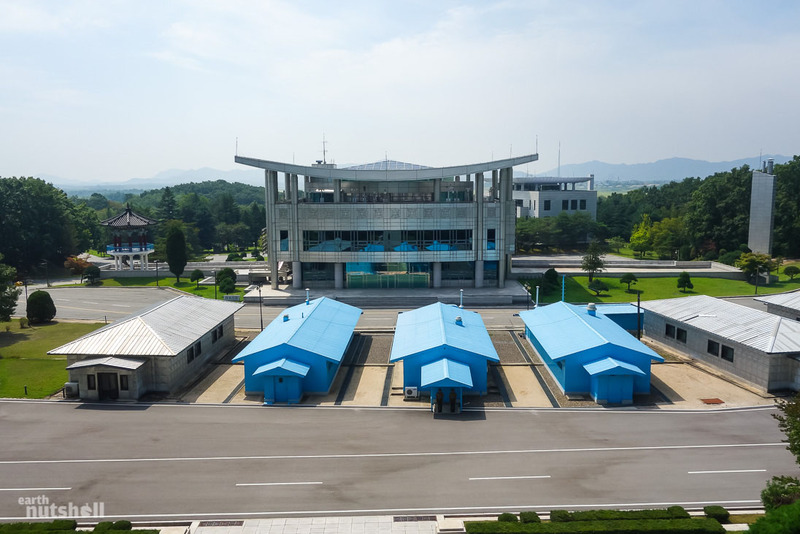 The blue buildings are halfway in each Korea and by entering them, one can theoretically cross to the South. The large building ahead is the ‘Freedom House’, ironically housing a dozen surveillance cameras. Tonight’s dinner was petrol clambake. 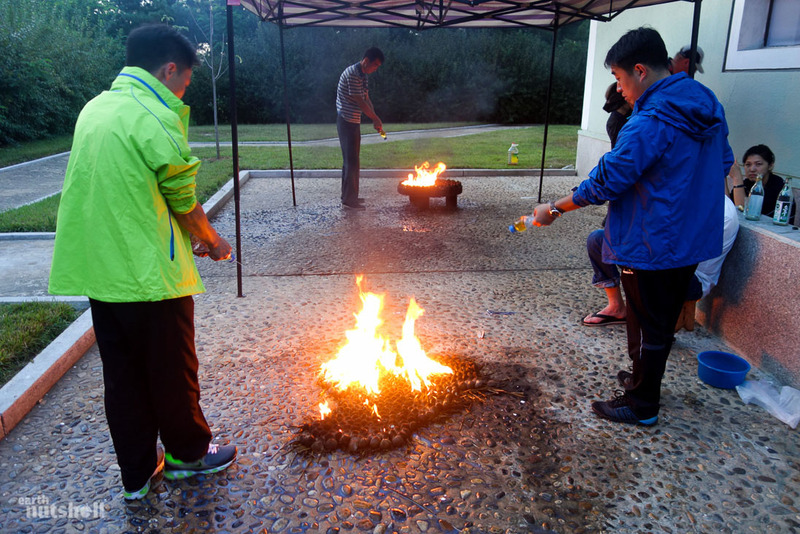 Clams were lit on fire with a layer of gasoline, and they’re cooked by spraying more gasoline until golden brown and ready to eat! 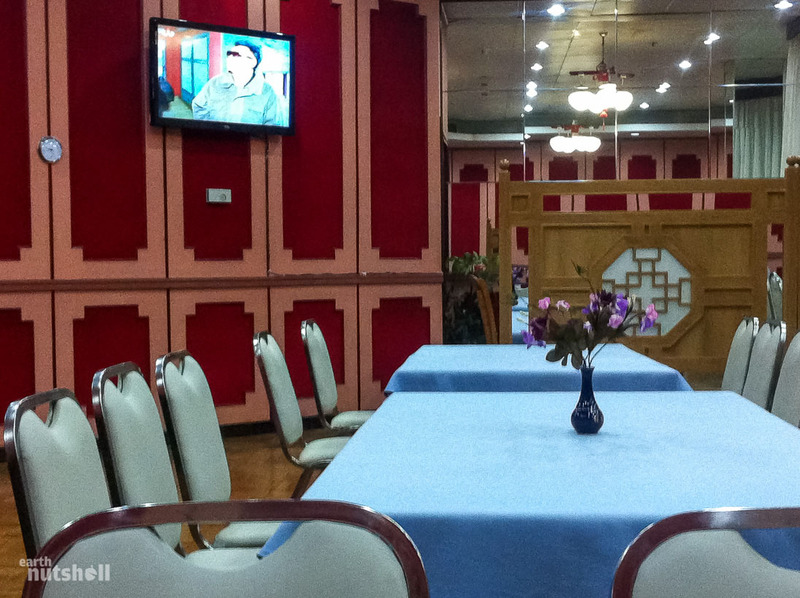 It was surprisingly delicious and has been one of my most memorable meals in North Korea. Say what you want about Pyongyang but it doesn’t lack charm. Formally dressed ladies arriving to show their respects to the Great Leaders lying in state at the Kumsusan Palace of the Sun (The Mausoleum). 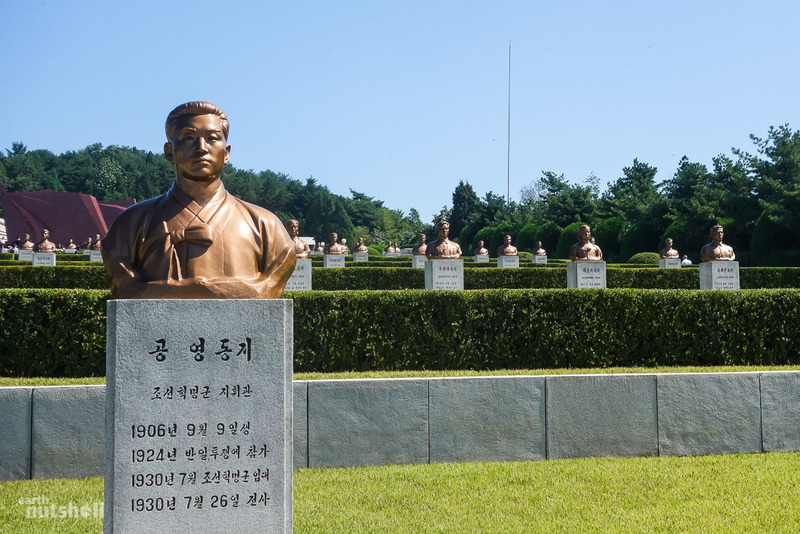 The Revolutionary Martyrs’ Cemetary is the memorial to those North Koreans pivotal to victory in the Anti-Japanese Struggle. Each tombstone here has been individually sculpted to the fallen. The grave of Kim Jong-Suk, President Kim Il-Sung’s first wife sits at the very top and it’s customary to lay flowers. 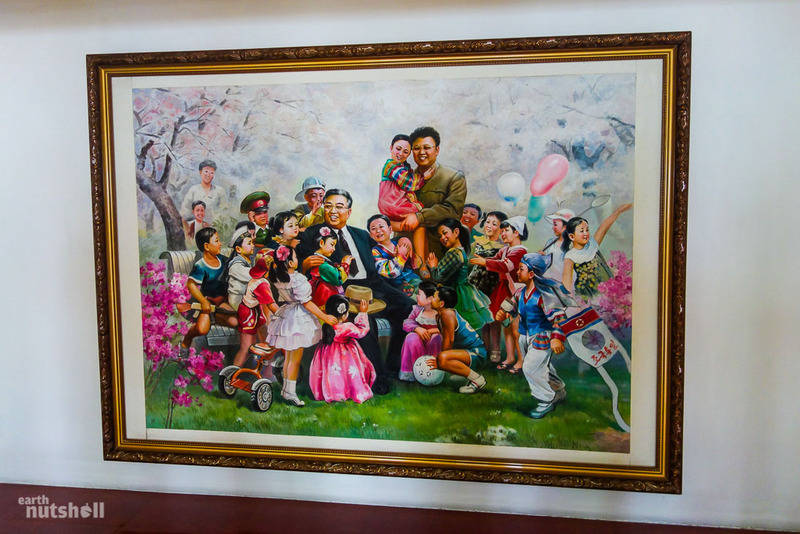 Kim Jong-Suk has been glorified as the definitive Anti-Japanese hero and a motherly figure to North Korea, enjoying a position in the Kim family personality cult, sometimes appearing as the third portrait in homes. 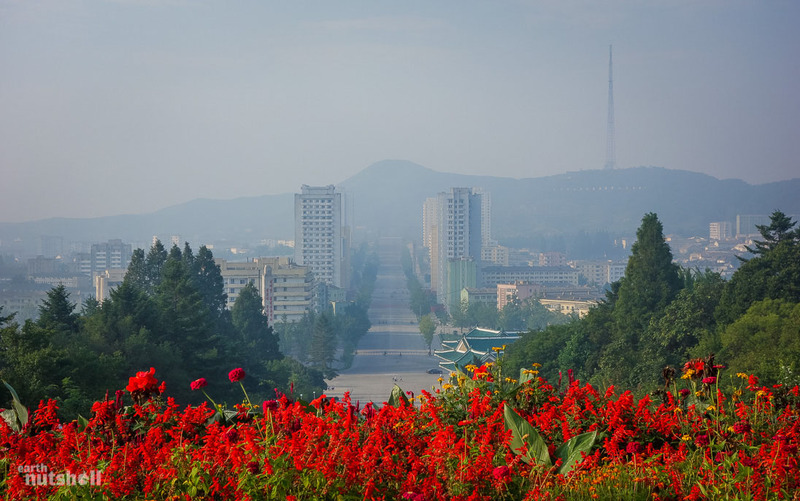 The locations are meticulously selected in North Korea and this cemetery faces a phenomenal view of Pyongyang. This is the first thing you see upon entering the orphanage in the city of Nampo. I’m undecided whether it’s cute, creepy or downright disturbing. 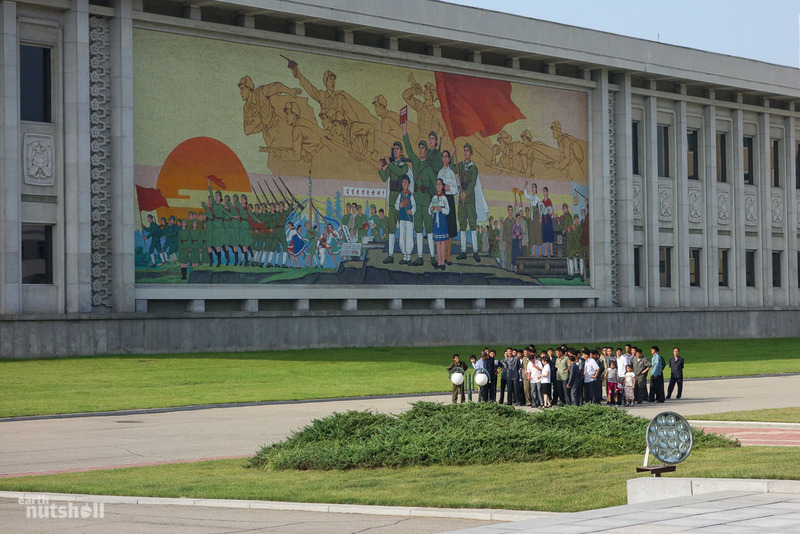 I didn’t like this place and felt it to be one of the more obvious and unnecessary facades in a visit to North Korea. All photos of the Great Leader’s must be in a frame that’s thicker at the top, this way they are always looking down upon those in the room. It’s a legal requirement for these portraits to feature in every household and be regularly cleaned with a special cloth for official inspection by the state. Korean People’s Army officers stand guarding the door to South Korea at the DMZ. One step between them and late-stage capitalism. 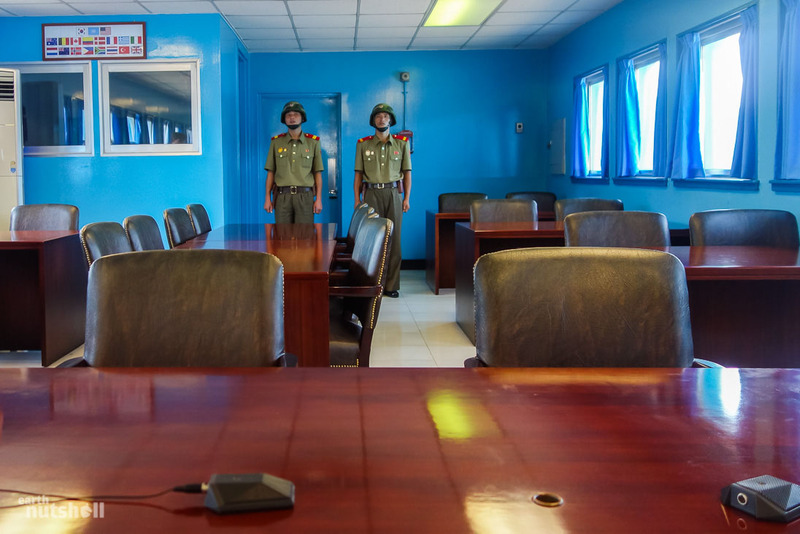 These officers are technically standing in South Korea, the conference room is split in half and used for negotiation purposes. 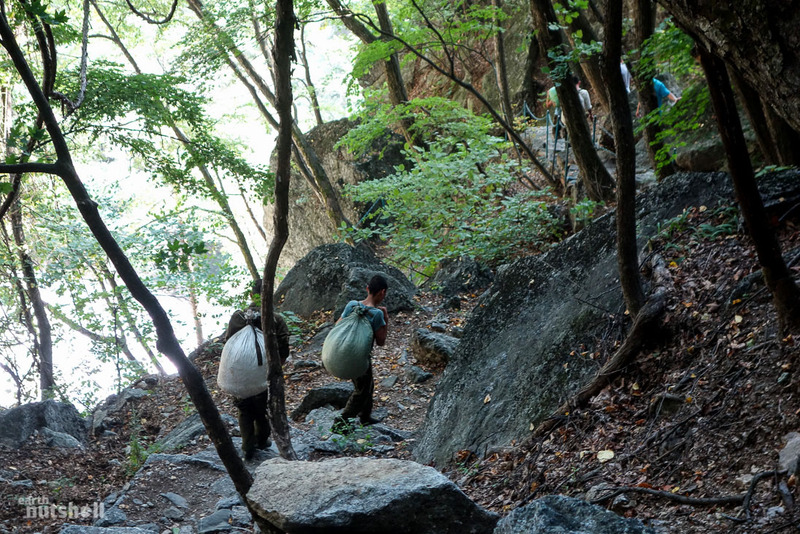 Locals seen tirelessly carrying sacks up and down Manphok Valley at Mt. Myohyang for weight training. Some are very young. 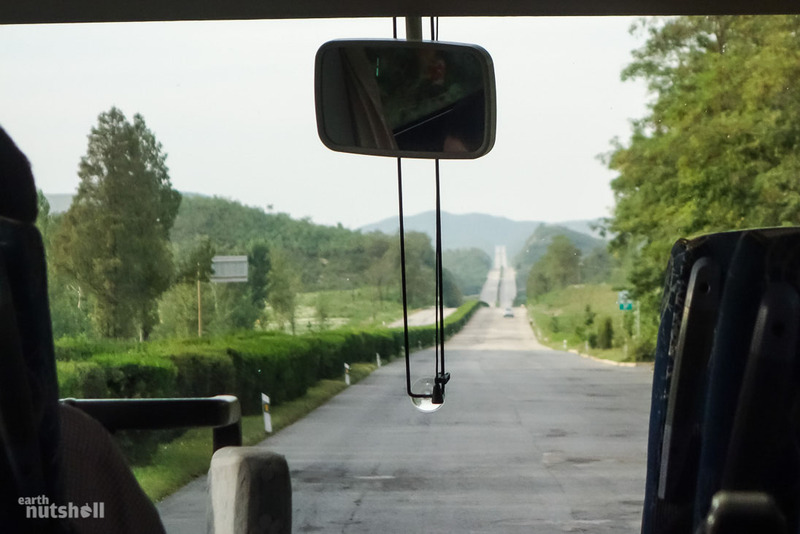 This is the Pyongyang-Kaesong Motorway (Reunification Highway) providing a direct link to the DMZ. It’s a long, lonely controlled access no man’s land bypassing most rural towns and villages. 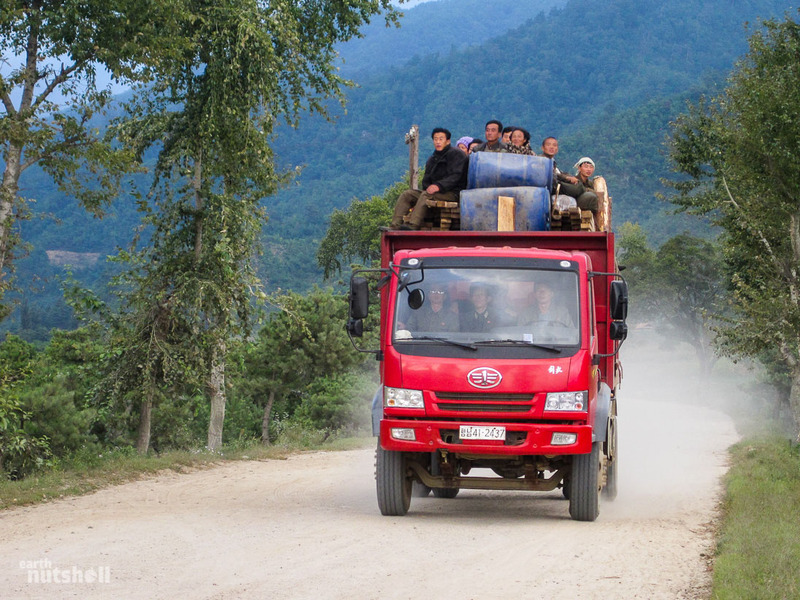 It’s rough, potholed and poorly maintained but it’s still the best highway in the North Korea outside Pyongyang. There were seven military checkpoints from Pyongyang to DMZ. I played a round of golf at Pyongyang Golf Course. One of my guides came prepared for a day on the grass by wearing high heels. She quickly regretted that decision. My guides knew nothing about golf and had never visited the course before, it’s so rarely visited that we even got lost trying to find it. 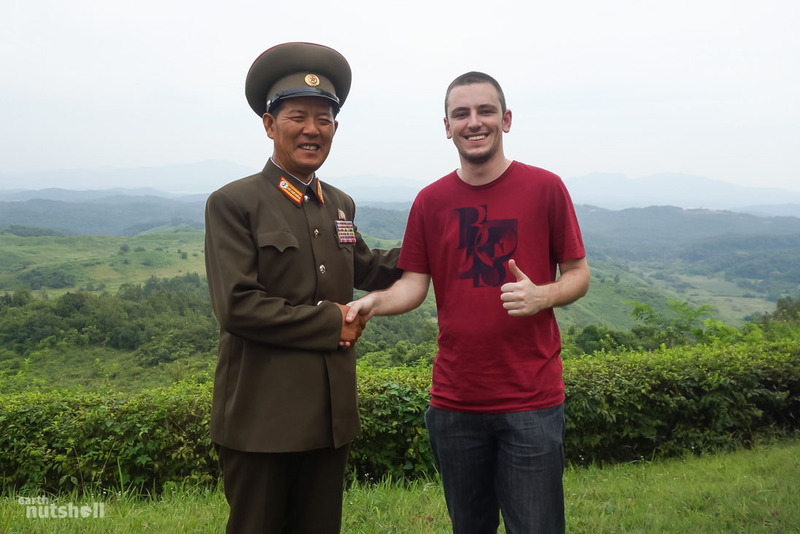 My 18-hole round here ended up being one of my favourite experiences in North Korea, here is a further look. ‘On-the-spot guidance’ is a North Korean term referring to an official visit by the Great Leader. Their visit will be documented and immortalised with the date, how many times they have visited and often a marking on the ground accompanied by a photo. This was true for any brick and mortar establishment ranging from supermarkets, museums, schools to farms. 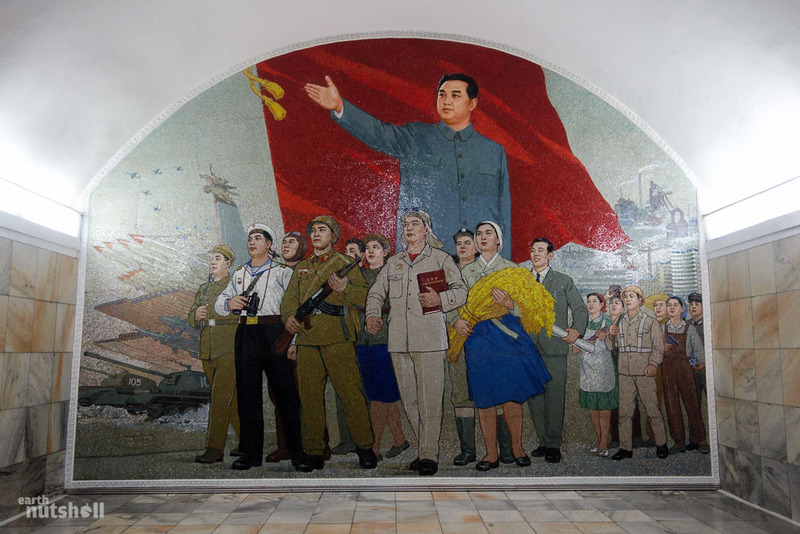 Each of the sixteen stations in the Pyongyang Metro had an expansive mural like this. Every station had a unique theme. Early morning in Kaesong city. As I took this photo, propaganda speeches were loudly blasting into the streets from loudspeakers placed on buildings. There is no vehicular traffic, so the city is eerily quiet except for that melodramatic voice piercing the streets. It felt like a textbook example of communist society. 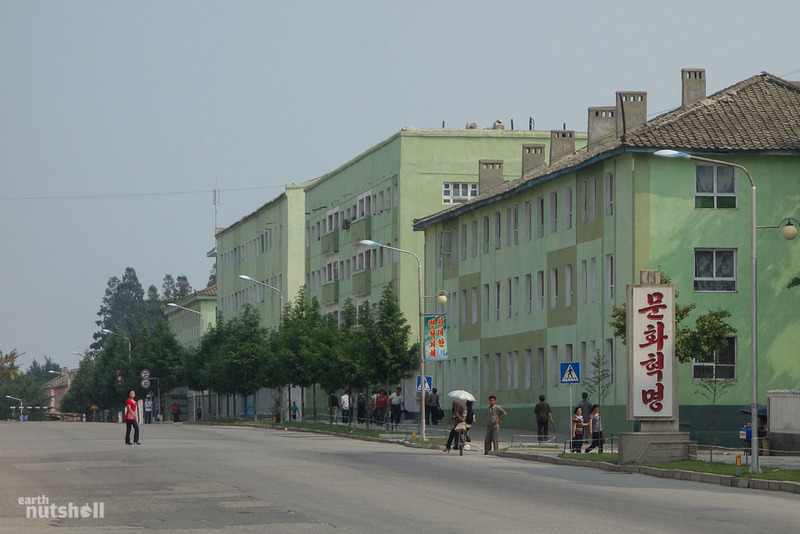 ‘Folklore Street’ is a development in the city of Sariwon, south of Pyongyang. Its purpose is to present a romanticised version of ancient Korea. 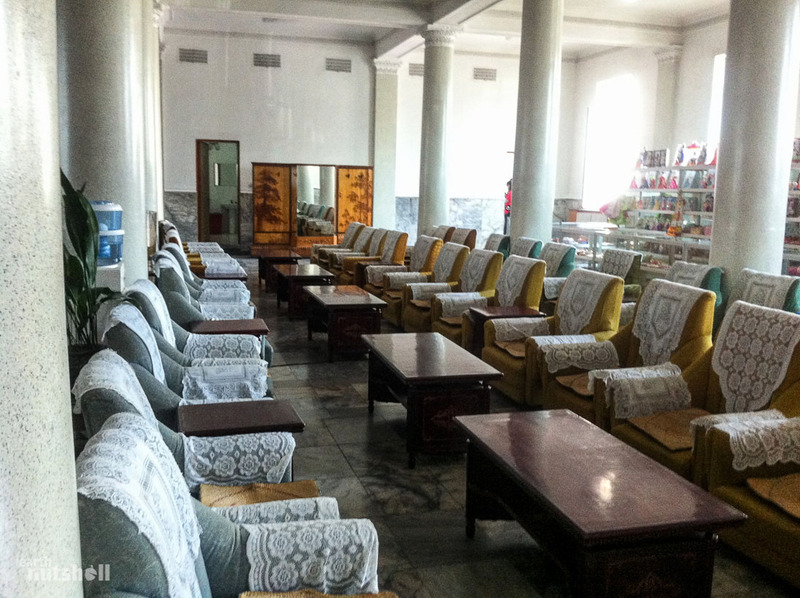 This is the regally decored and empty waiting room at Pyongyang Train Station. There is an international train that departs every day for Dandong, China. American citizens are banned from entering or departing North Korea by train. 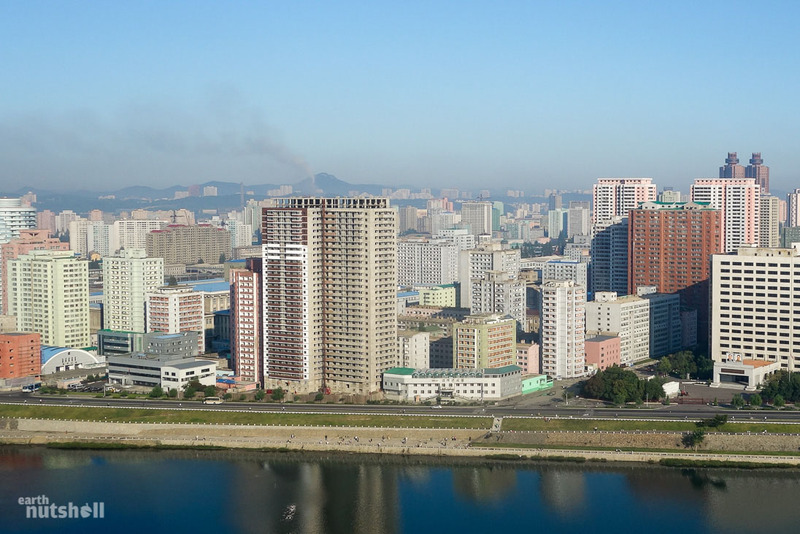 Pyongyang appears to be pieced together like colourful lego from a distance. This is the entrance to the International Friendship Exhibition. The doors part ways as you approach. Behind is a lavish tunnel system carved into the mountains with numbered rooms which proudly display hundreds of thousands of gifts given to each Great Leader by foreign governments and entities. The basketball signed by Michael Jordan and given to General Kim Jong-Il by Madeleine Albright is showcased here, as are extravagant gifts like golden AK47’s, bear skin rugs and even a taxidermied alligator cocktail server. Almost every nation on earth is represented and this site is used as evidence of the Great Leader’s international diplomacy prowess, influence and endearment. South Korea is in the distance. This photo was taken an hours drive east, parallel to the Demilitarized Zone at what is known infamously as the ‘Concrete Wall’. The North Koreans claim this wall spans the entirety of the peninsula and was built by South Korea and the Americans to restrict free passage into the South and ultimately prevent a unified Korea. It’s been a mainstay to the North Korean victim-complex for decades. Even with binoculars and a clear day, the wall was nowhere to be seen. The Concrete Wall was truly a weird visit, I documented it for you here to read. The American ‘Spy Ship’ USS Pueblo was captured by North Korea in 1968. It remains docked in the Taedong River in Pyongyang and is used as a leading propaganda tool, solid evidence of American aggression. 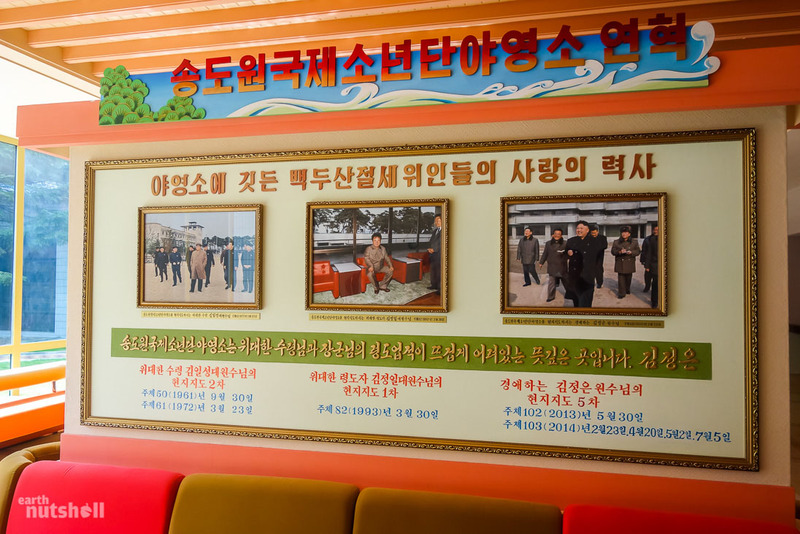 As a tourist you’re encouraged to board the vessel where you’ll see bullet holes, watch a video on the capture and hear stories of North Korean heroism. 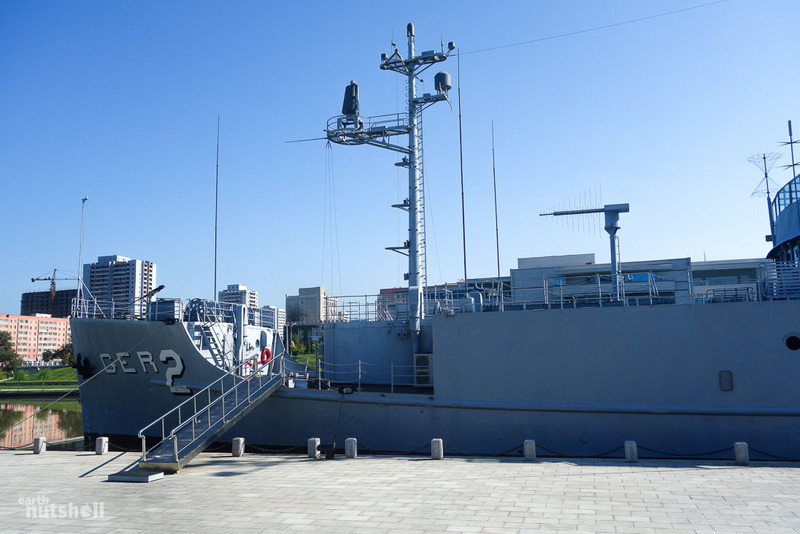 The USS Pueblo remains a commissioned vessel, the only American vessel still held captive. 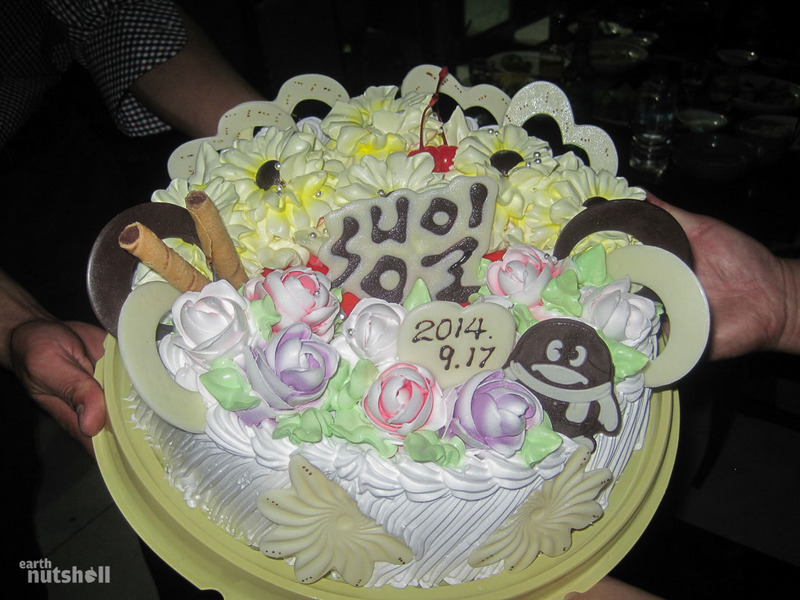 I had my birthday in North Korea and this was my lavish cake. It was a great night, one to remember! 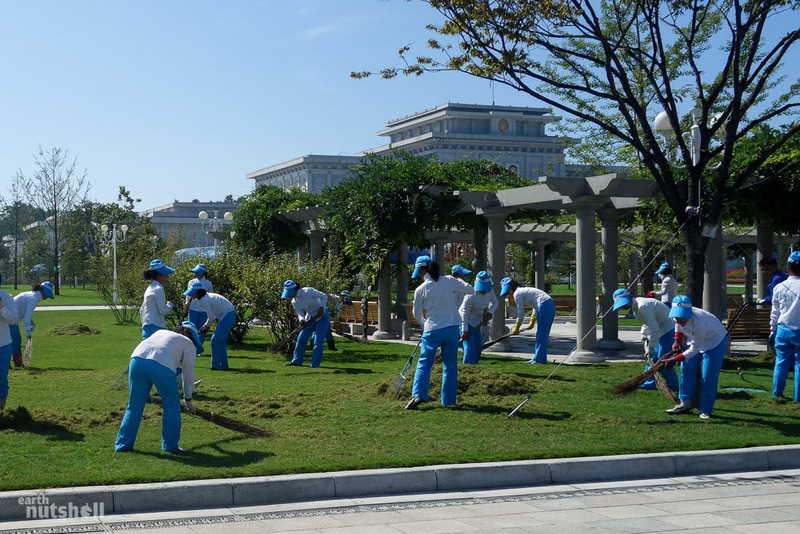 Gardens are easily maintained in Pyongyang. Photo taken at The Mausoleum. Kwangbok Supermarket, Pyongyang. 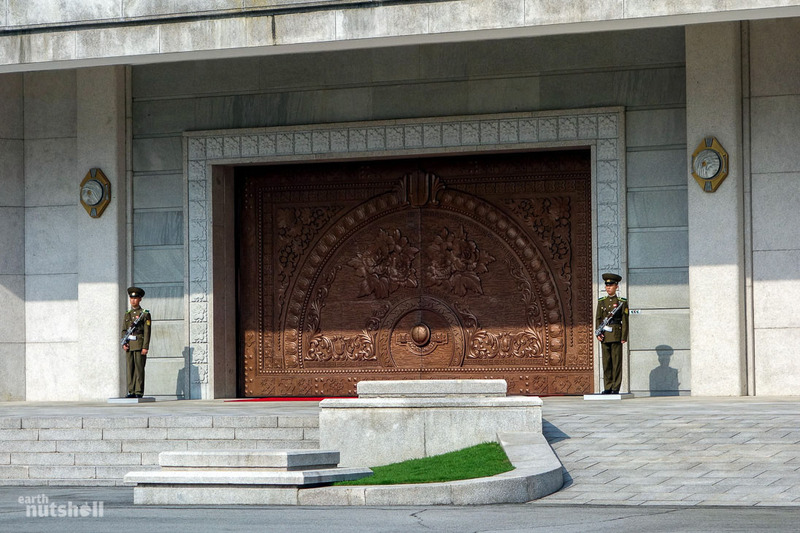 The plaques above the door indicate the visitations of General Kim Jong-Il and Marshal Kim Jong-Un. This had only just opened and I was the second foreigner ever allowed inside. The payment process was confusing and there were lots of Chinese products. Photos were banned. I was told that everyone shopped here, but realistically this was a store reserved for the relatively wealthy with disposable income. When I was in primary school we took excursions to a local quarry to take rock samples to learn about geology. 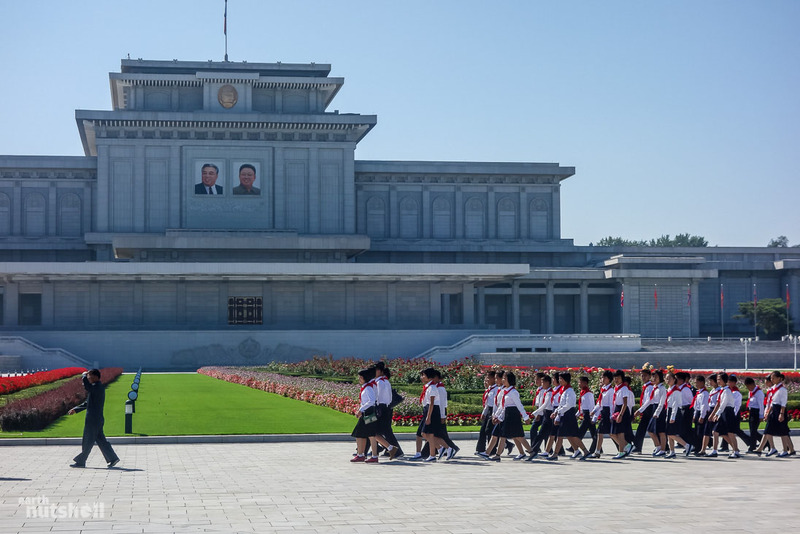 In North Korea, schoolchildren will be led on a school excursion to visit the embalmed bodies of their late leaders at the Kumsusan Palace of the Sun. Discipline is strict and formation is ingrained. Political indoctrination is from a young age. 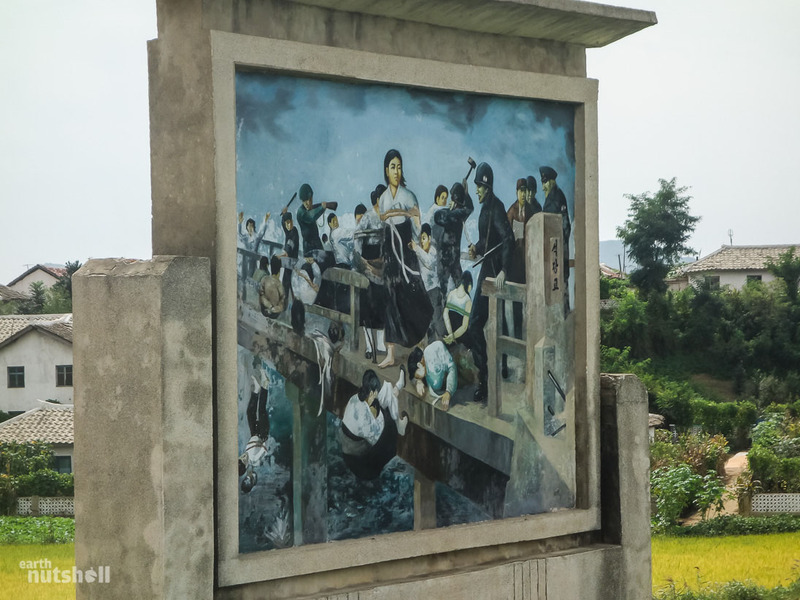 A mural marking the entrance to Sinchon, the location of an alleged brutal massacre at the hands of the United States during the Korean War. We visited here for the Sinchon Museum of American War Atrocities. 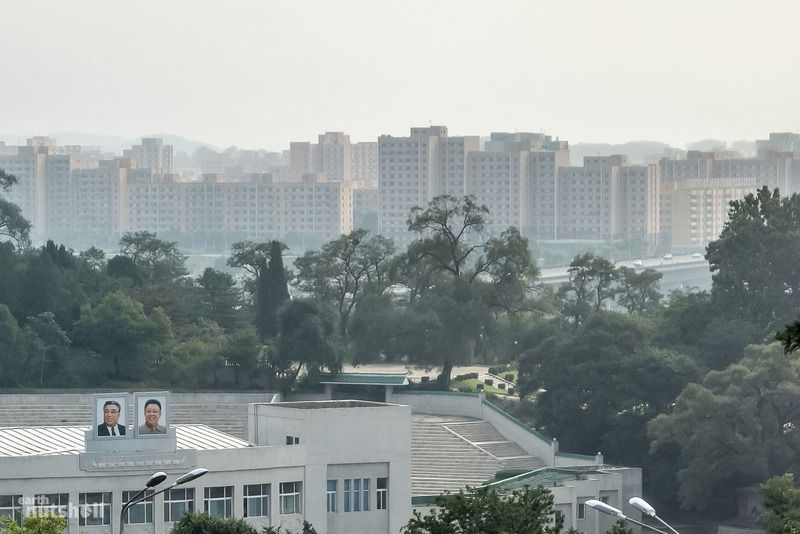 Spotlights surround sites of national importance all over North Korea. We were advised of hidden surveillance, too, but this is unconfirmed by my account. 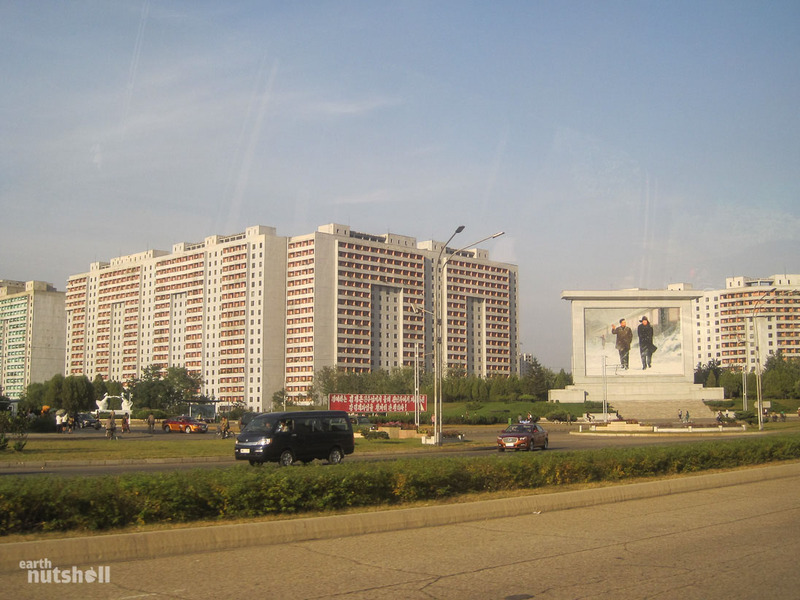 “According to the Party’s leadership, let’s work vigorously to a more prosperous country and homeland!”, “Let’s sweat more for the motherland!”, “What have I dedicated to the country?” A rare look at the North Korean manual labour industry, we were taken to the Hungnam Fertiliser Factory in Hamhung. I felt that if this place was the best example of workforce conditions, the rest of them were best kept secretive. “Let’s get revenge on the imperialist murderers who brutally murdered our innocent children!” Photo taken in Sinchon. This man is one of the three survivors pictured to the right of an alleged massacre by the United States of women and children in a nursery. Just outside is a giant mural depicting American soldiers murdering women and throwing and stepping on the necks of children. This is the Kimjongilia, a type of begonia named after General Kim Jong-Il and unsurprisingly his favourite flower. 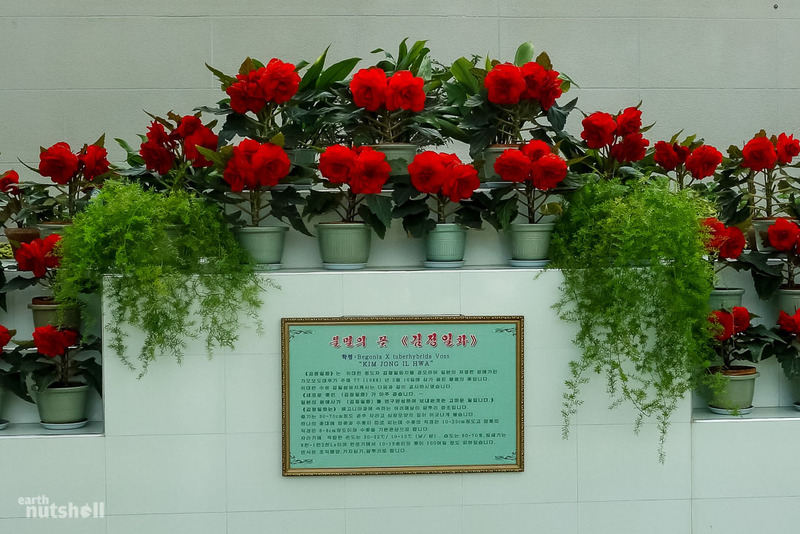 It adorned his corpse for public display after his death and each year around his birthday in February there is a Kimjongilia flower exhibition. There is also a Kimilsungia named after his father with an exhibition held during April. “If the great Supreme Commander Comrade makes a decision, we must proceed accordingly!” I didn’t know it at the time, but this construction ended up being the renovated Mangyongdae Children’s Palace, an extracurricular school in Pyongyang for the gifted and privileged to reach their potential in arts, crafts and sports. It’s now a popular place to visit on tourist itineraries. “Long live the great Comrade Kim Jong-Un, the sun of Songun (military-first) Korea!” En route to Mt Myohyang. I hate to say it but similarities between broken, desolate cities in most zombie apocalypse movies just can’t be dismissed. Rich colour and a dull cityscape. Welcome to Kaesong. 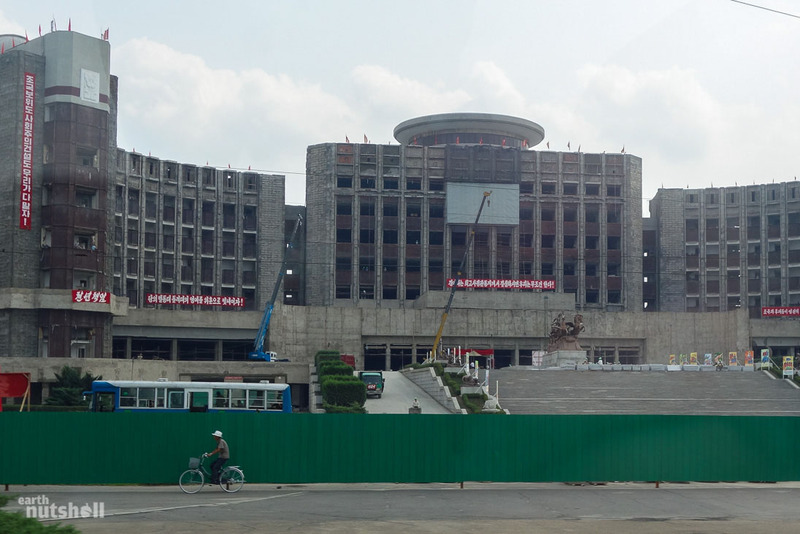 “The Great Comrade Kim Il-Sung and Comrade Kim Jong-Il will be with us eternally.” A major ministerial building in central Pyongyang. 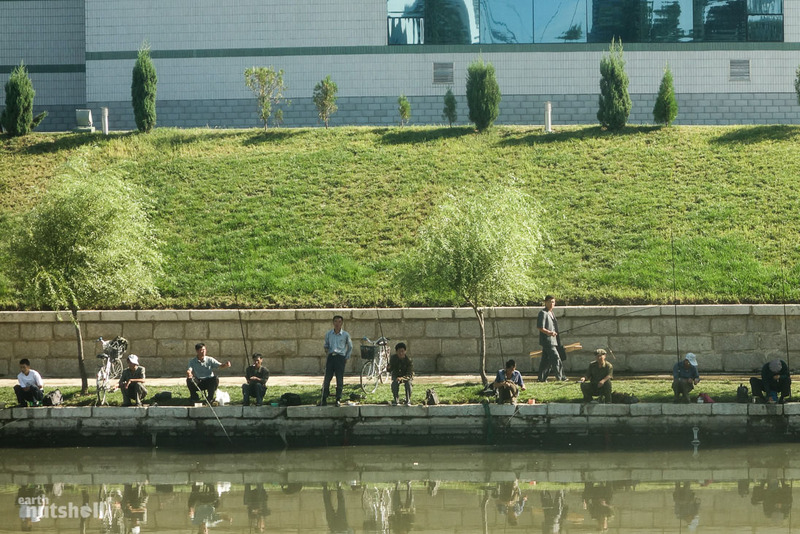 Locals fishing in the Taedong River, Pyongyang. This photo was taken through a porthole on the captured American ‘Spy Ship’ USS Pueblo docked here. 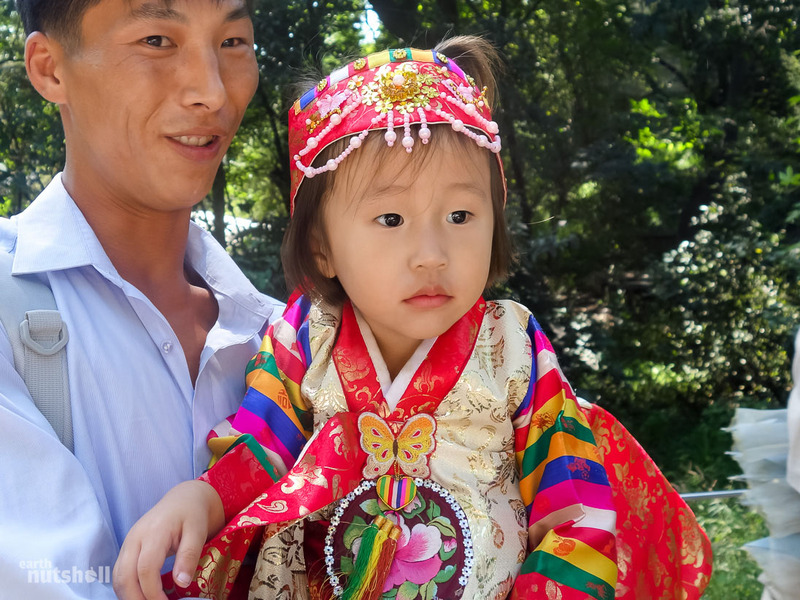 A young girl dressed for the National Day festivities in Moranbong Park. Young North Korean soldiers partaking in a mixed-gender military drill somewhere between Wonsan and Hamhung on the east coast. North Korean citizens are conditioned to be ready for war at all times, undergoing regular training drills, evacuation drills and air raid drills. 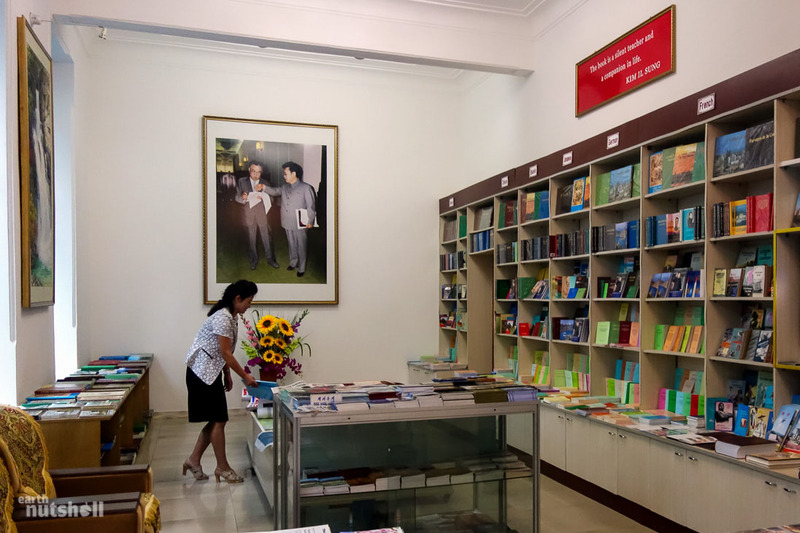 The Foreign Languages Bookshop in Pyongyang. 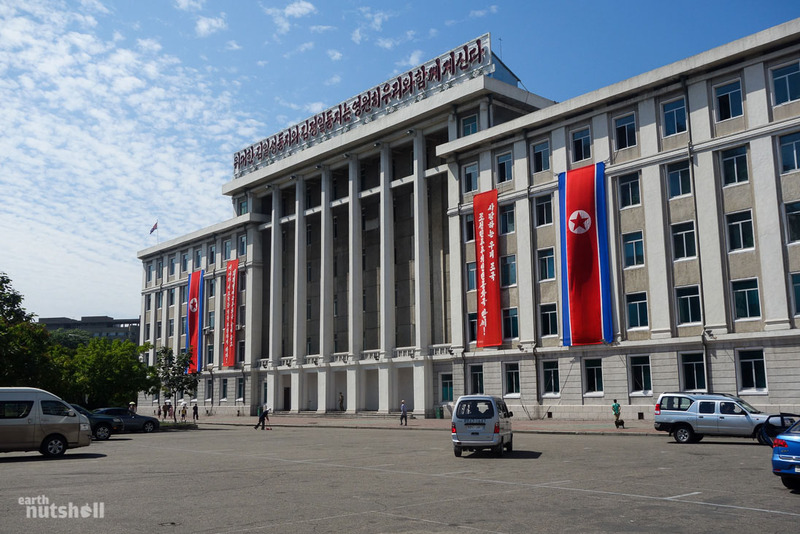 This is a common stop on a visit to Kim Il-Sung Square and has some great souvenirs not limited to books, including posters, stamp collections and postcards. If you’re after a published text, why not treat your mother on her upcoming birthday with a copy of “Kim Jong-Un – Let Us Brilliantly Accomplish The Revolutionary Cause Of Juche Holding Kim Jong-Il In High Esteem As The Eternal General Secretary Of Our Party.” This is an actual title I found in the store. 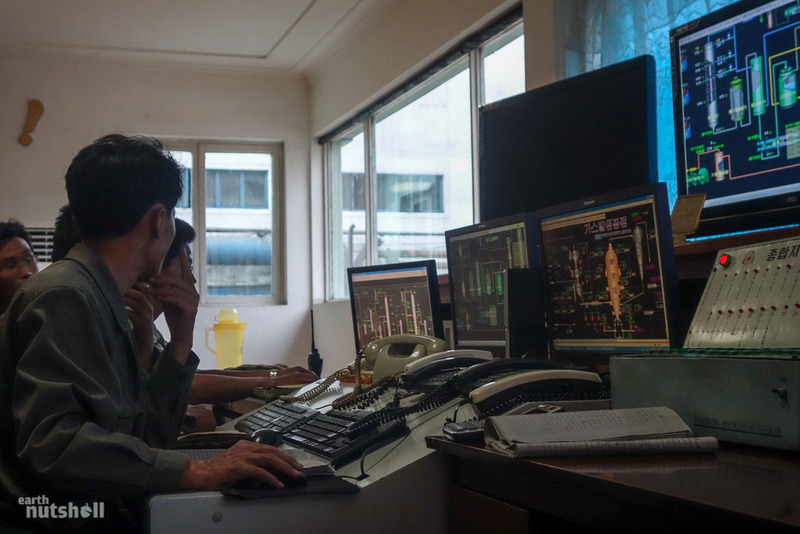 We were taken into the control room of the Hungnam Fertiliser Factory to meet those in charge and ogle at the technology. Windows is used as the operating system as it was at the Grand Peoples Study House in Pyongyang. America can’t be that bad after all. 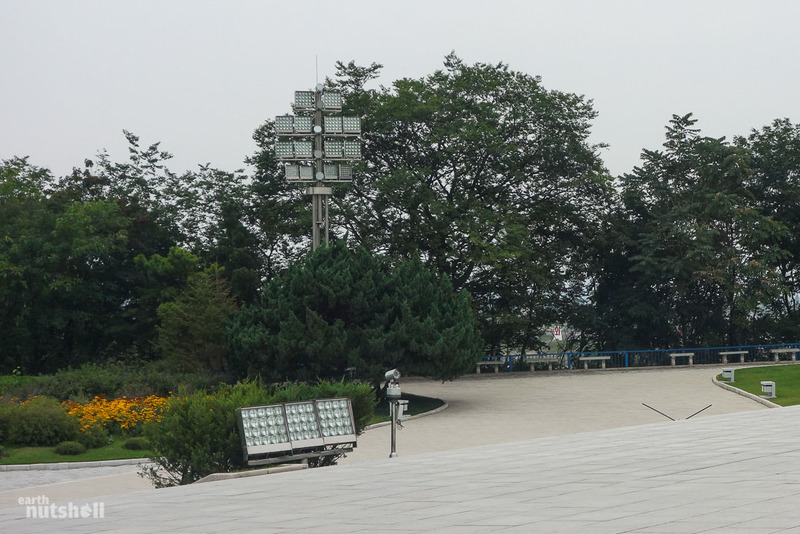 This couple were having their wedding day photos taken at the Pyongyang Botanical Gardens. The bride, groom and family included us in some photos. 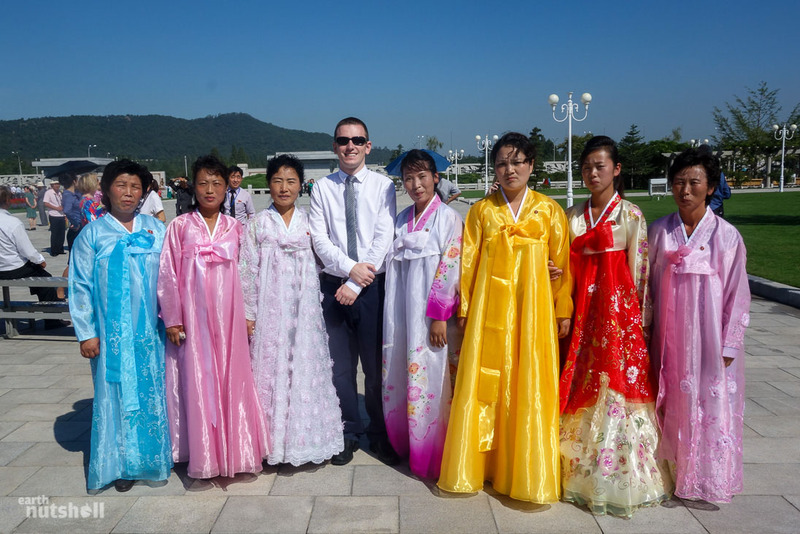 We weren’t exactly dressed for the occasion but I can’t imagine many North Korean weddings have had foreigner attendees, so they likely acquired some bragging rights today, as did we. A table laid out for one in an empty restaurant, three waitresses and ten plates of food which I didn’t even put a dent into. Out of every table available, mine faced the Korean state television broadcast. This is no coincidence. 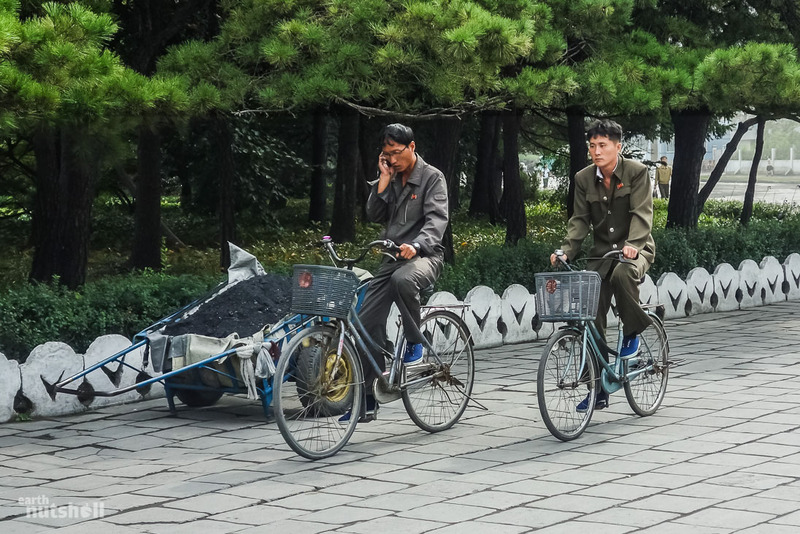 Mobile phones are now commonplace in North Korea’s major cities. ‘Bar’ phones, flip phones and touch screens were all available, usually Chinese imported models with customised (censored) software. 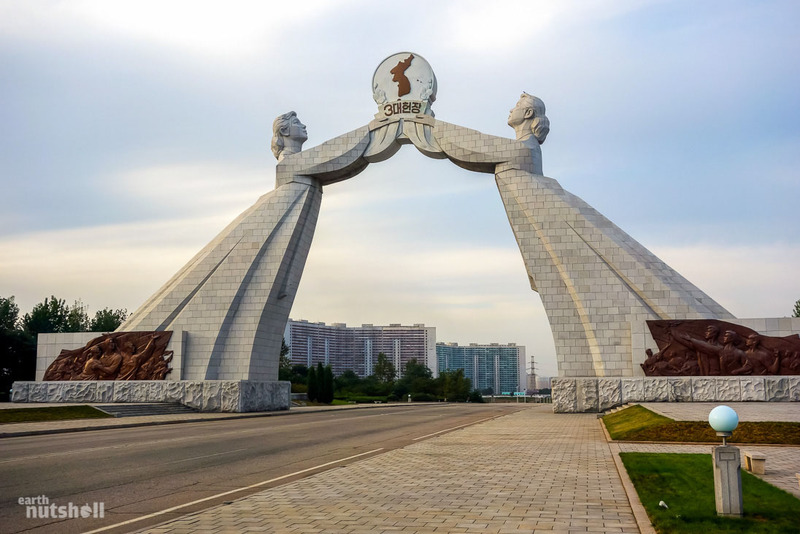 They connect via Koryolink, North Korea’s main telecommunications network that has blocked both internet access and international calls. Koryolink has a separate network for foreigners and you are unable to call North Korean SIM’s and they can’t call you. 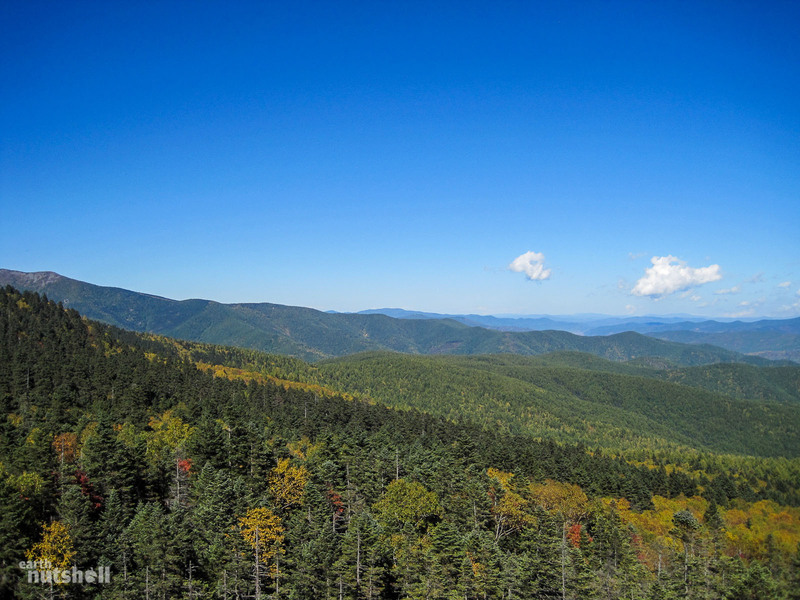 The autumn woodlands in the untouched countryside of Pujon County. This is a remote area of the country rarely seen by foreigners as it’s only visitable on certain itineraries a handful of months a year. Apartment blocks all over the country are simply cold, depressing, weathered old slabs of concrete. North Korea has freezing, snowy winters without any heating and agriculture come to a halt. It must be a rough time to be a North Korean. 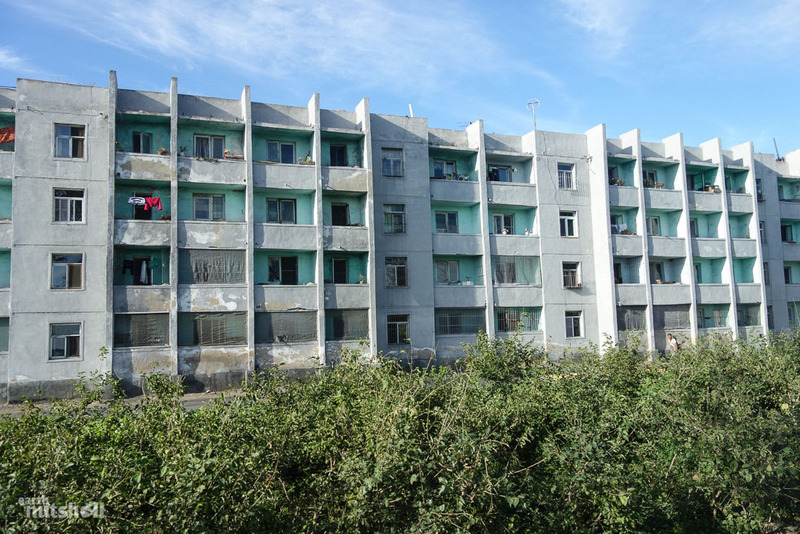 This is some local housing pictured on the west coast on the outskirts of Nampho. 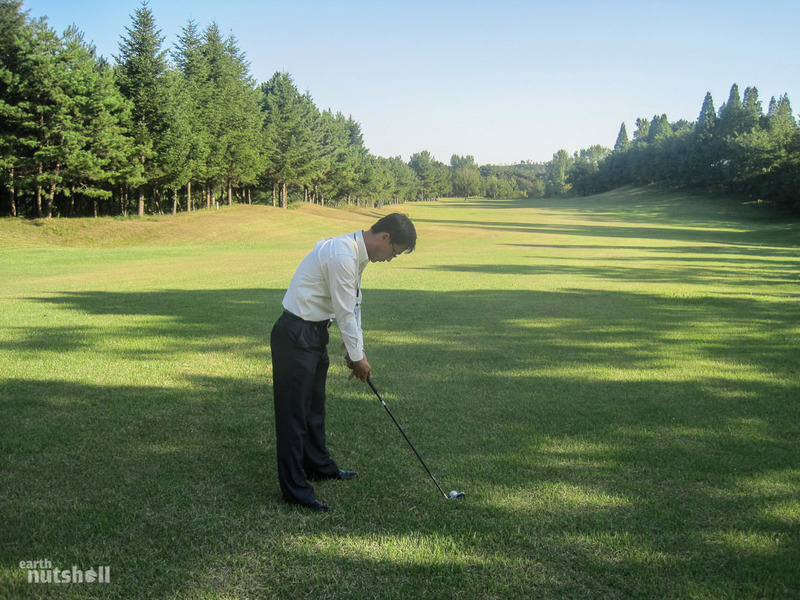 This is one of my guides taking his first ever golf shot at Pyongyang Golf Course. He had never heard of golf before today and he took a real liking to it. A 4 hour round turned into 6 hours as he was adamant on learning. 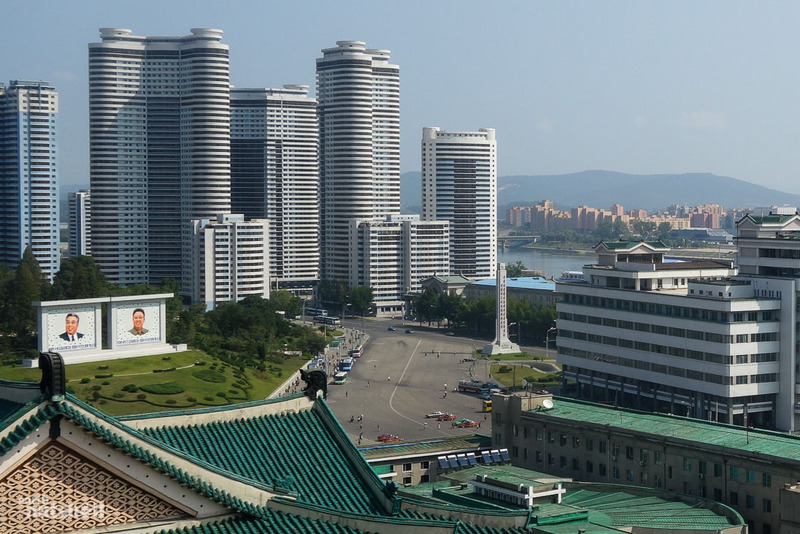 With this scene in Pyongyang, you could almost forget you were in North Korea. Note also the solar panels on the street lights. Haeju. Americans tourists are not welcome here, literally. If you have Americans on your tour you’re are not allowed to stop anywhere in Haeju. We had to get special approval for a toilet stop in a hotel not visible to the street. 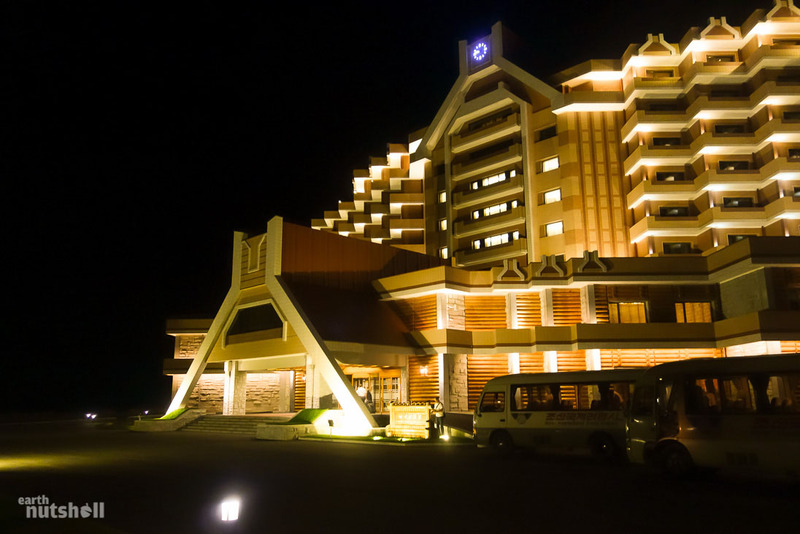 This is Masikryong Hotel inside the Masikryong Ski Resort (Masik Pass), one of the most luxurious hotels in North Korea. It was built at the order of Marshal Kim Jong-Un in just 10 months by the Korean People’s Army to boost tourism numbers. It’s situated in the middle of nowhere and the lights on arrival hit you like a hotel in Las Vegas. I visited during summer so there was no snow and no other guests, yet there was more staff than us. It was an odd visit, but an international standard 5-star hotel inside. 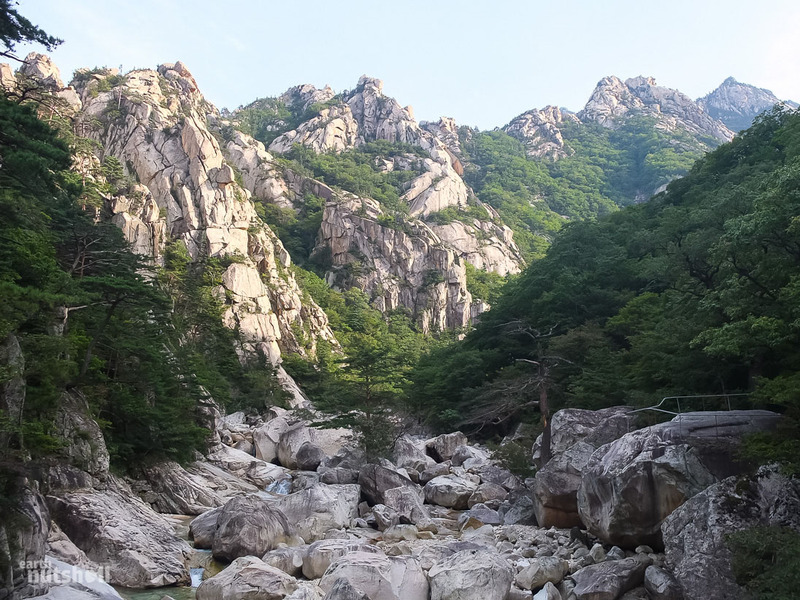 Mount Kumgang (Kumgangsan) is known for its exclusive scenic beauty found nowhere else in North Korea. We did some hiking here to reach Kuryong Falls. It’s quite close to the border with South Korea on the south east coast. 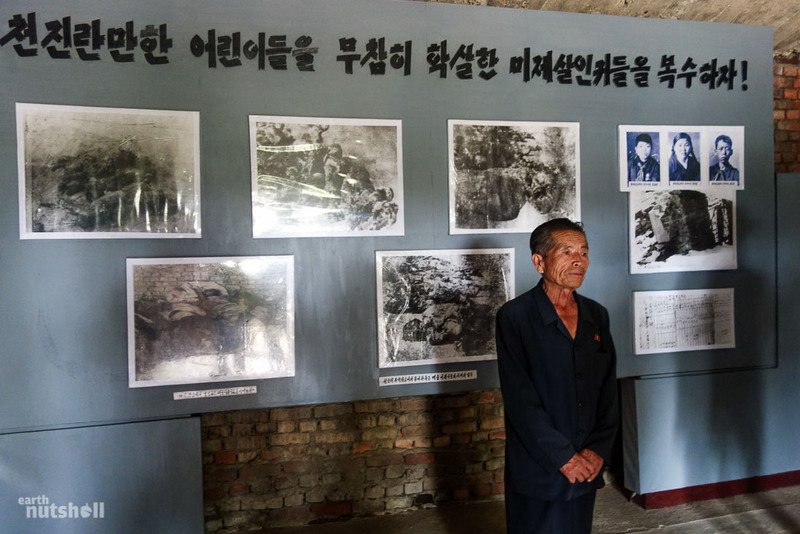 Once upon a time, South Korean tourists were permitted to visit this region of North Korea on short tours across the DMZ and it’s noticeably sterile of propaganda. 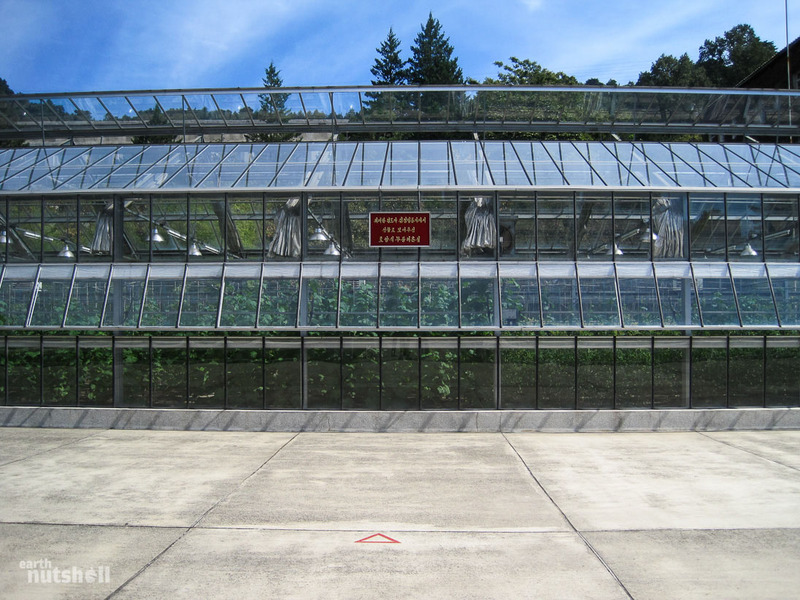 “Pollution-free greenhouse the Great Leader Comrade Kim Jong-Il has sent us.” This is the Wonsan Agriculture University, the triangle on the ground is where General Kim Jong-Il stood when he had his photograph taken here. 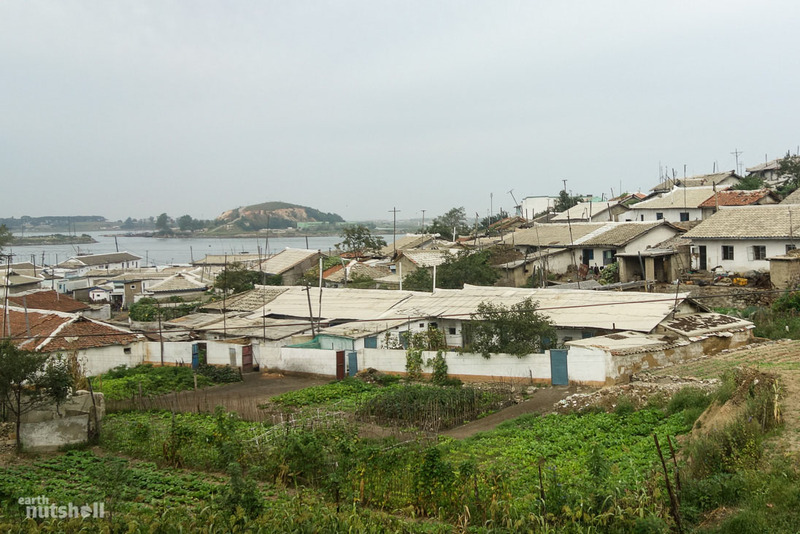 The majority of crops in North Korea are tended to by hand, as machinery and fuel are in short supply. Murals are on every corner and are simply unavoidable. 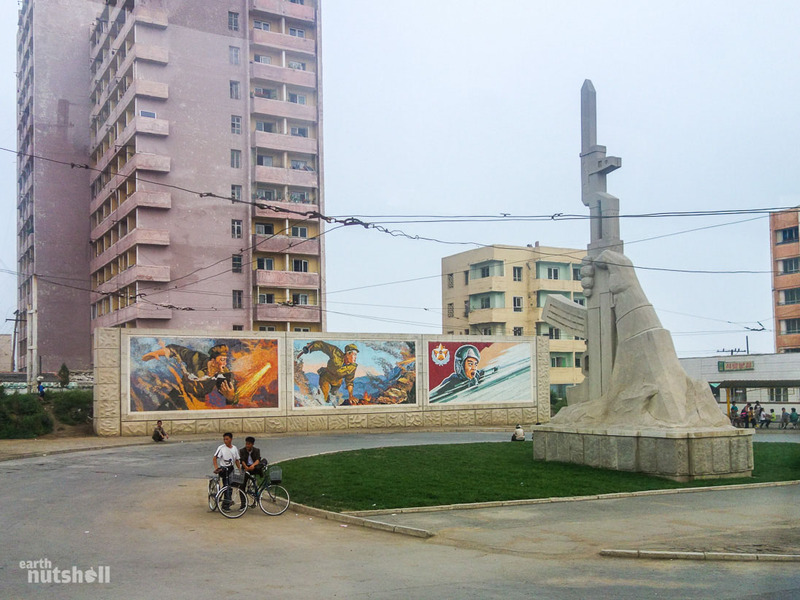 Here’s another gigantic mural at the entrance to the Pyongyang Feature Film Studios. 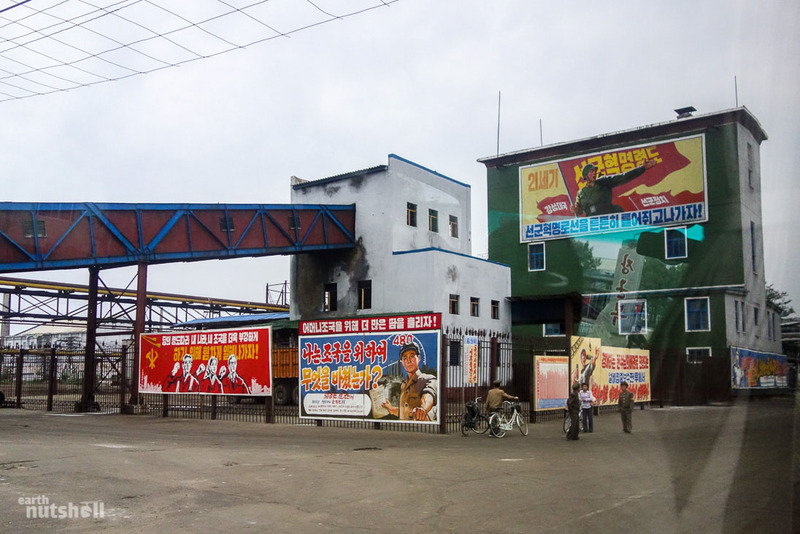 This is where the North Korean blockbuster films you know and love have been produced. 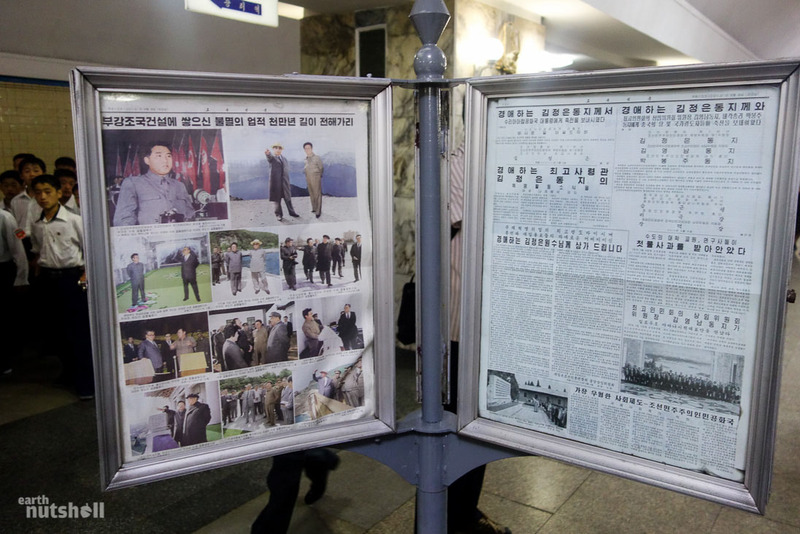 General Kim Jong-Il, a great lover of film, is said to have visited here hundreds of times. There are movie sets here replicating historic Japanese and European streets with surprising accuracy. 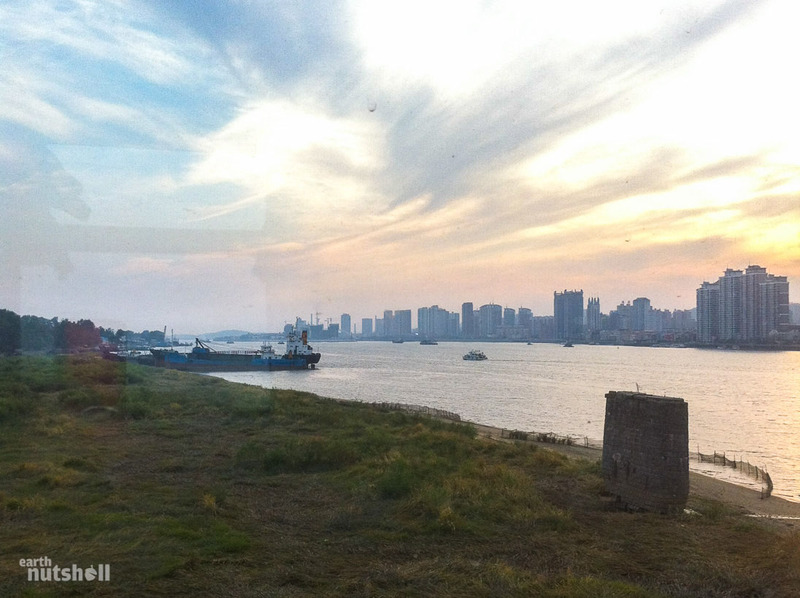 This photo was taken in Sinuiju, North Korea and that is China you can see across the water. I had just endured over two hours of search and I was now free to cross the ‘Friendship Bridge’ connecting both nations into the relative freedom of ‘Communist’ China. 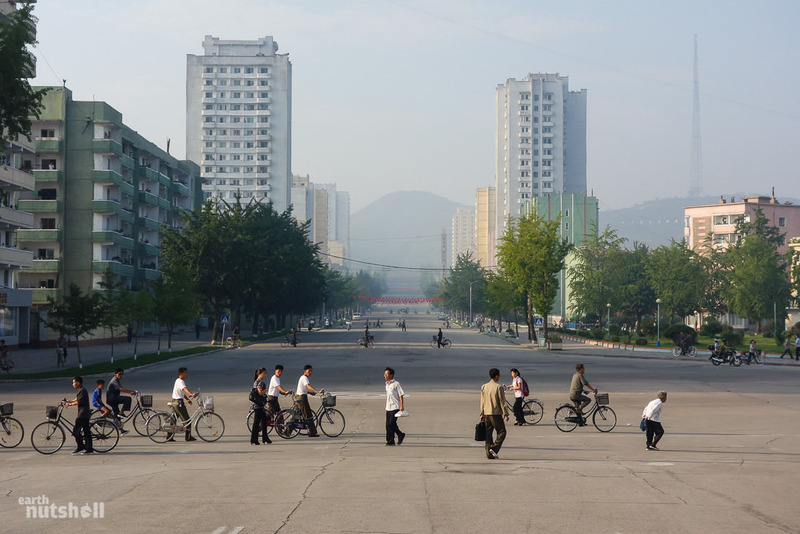 This photo is a true window into Pyongyang and the political smokescreen it upholds. Those beautiful skyscrapers are not representative of anywhere else in the country. I found this so interesting. Thank you. I’d lived and worked in the south for 3 years but never visited the DMZ. Great insight and easy reading. Did they explain why Haeju is forbidden to Americans? It’s astonishing to me that the people still live under such a strict and crazy ruler. Very interesting and amazing pictures! Why were you allowed to take so many? Poor souls of North Korea, may they one day be set free!